On 2019/4/9, our Sand free mat was featured during a morning news program on NHK. Please check out the program here. 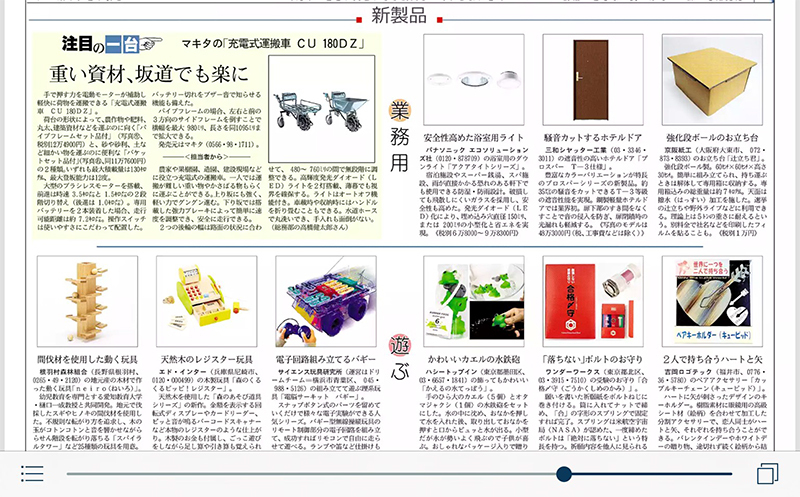 On 2019/3/13, our Moving Straps were featured during a news program on HBC called “Choukan Sakurai”. Please check out the program here. 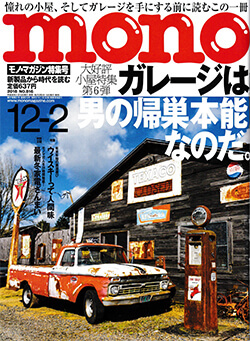 On 2019/3/7, our electric canvas Meural was featured on a online Magazine called “Hot Dog Press” No.221. Please check the article here. 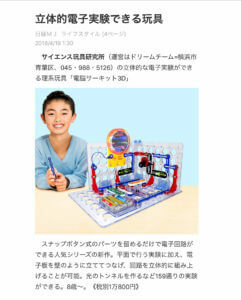 On 2019/3/7, our "Electric Circuits" was featured on a web magazine called "Ed Tech Communications" which introduces STEM toys and programming language. Please check out the article here. 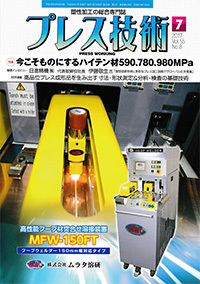 On 2019/3/5, our "Tough Braeon" was featured on a magazine called "Kazi" 2019 April edition as a mending tape that deforms when heated. Please check the article here. 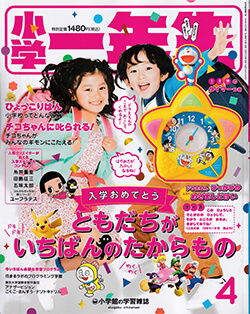 On 2019/2/28, our "Electric Circuits Play" was featured on a magazine for kids called "First Graders" 2019 April edition. Please check the article here. 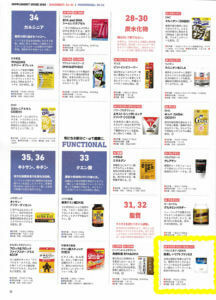 On 2019/2/21, our "Handy Muscle Builder Assist Tube" was featured during a TV show on NHK. Please check out the program here. On 2019/2/15, our "Hair Fixing Cap" was featured during a TV show called "Osaka Honwaka TV" on Yomiuri TV. Please check out the program here. 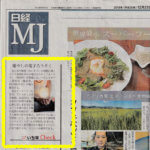 On 2019/1/30, our "Tough Braeon" was featured as a multitasking tape on a newspaper called "Nikkei MJ". Please check out the article here. 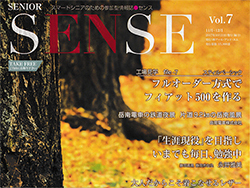 On 2018/12, “Portable Indoor Fireplace” was featured on a magazine called “SENSE”. Please check out the article here. 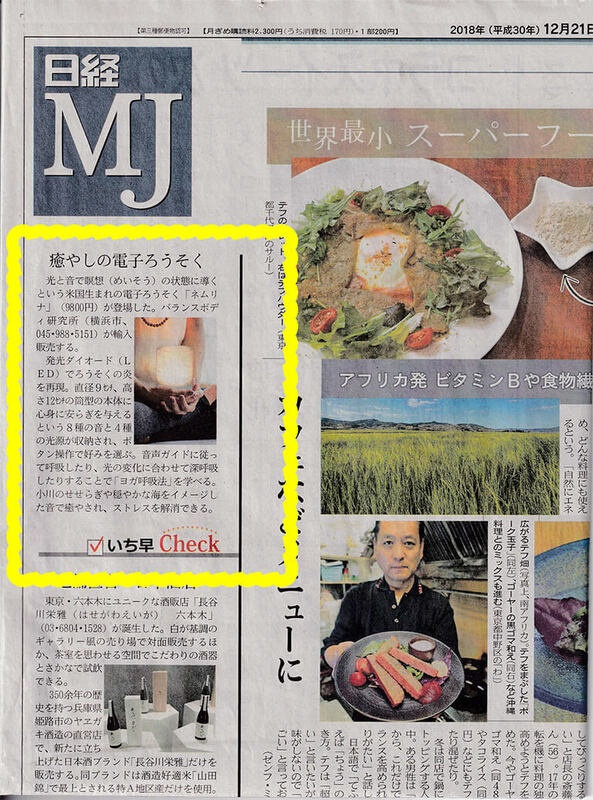 On 2018/12/21, our “Light and Sound Therapy Candle” was featured on a newspaper called “Nikkei MJ”. Please check out the article here. 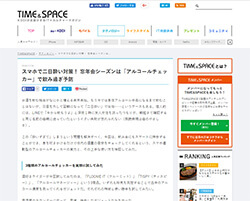 On 2018/12/19, our “Alcohol Breathalyzer” was featured on a web article called “TIME and SPACE” special edition. Please check out the article here. 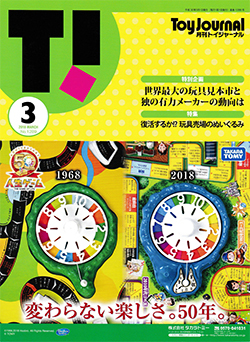 On 2018/12/15, “AB Wheel” was featured on a magazine called “Mono Max” special edition. Please check out the article here. 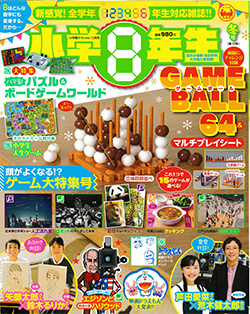 On 2018/12, “Electric Circuit 100” was featured on a magazine called “Partner”. Please check out the article here. 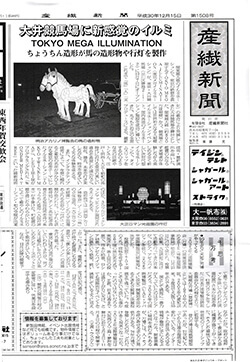 On 2018/12/15, “Tough Braeon” was featured on 2019 January issue of a newspaper called “Sansen Shinbun”. Please check out the article here. 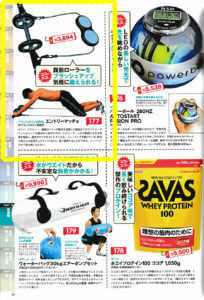 On 2018/12/10, “The Ultimate Core Training Roller” was featured on 2019 January issue of a magazine called “Muscle and Fitness”. Please check out the article here. 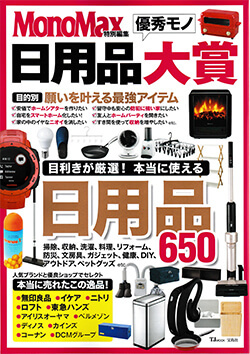 On 2018/12/3, our “Gent-Light” was featured on 2019 January issue of a magazine called “Consumer Electronics Review”. Please check out the article here. 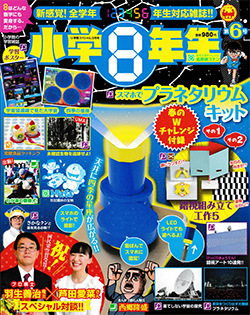 On 2018/11/16 Our “Good Day Light” was featured on “Mono Magazine” issued by World Photo Press Co., Ltd. Please check the article here. 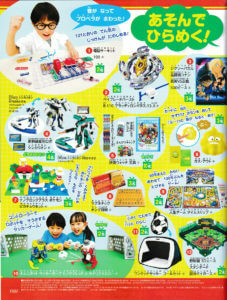 On 2018/11/15 Our “Electric Snap Circuit Green” was featured on “Shogaku 8 Nensei” issued from Shogakukan. Please check the article here. 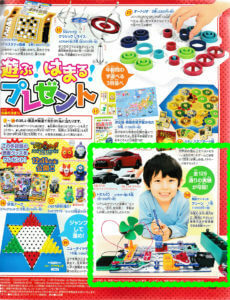 On 2018/11/9 Our “Electric Snap Circuit Play” was featured on “ReseMom” run by iid.Co., Ltd. Please check the article here. 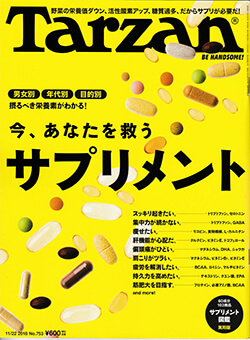 On 2018/11/08 Our Supplement L-Tryptophan was featured on “Tarzan” issued from Magazine House. Please check the article here. 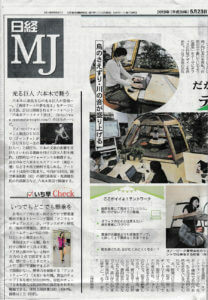 On 2018/11/02 Our “Portable Campfire” was featured on “Asahi News Paper”. 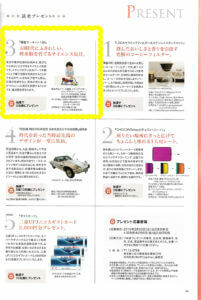 Please check the article here. On 2018/10/23 our “Portable Campfire” was featured on HBC Hokkaido Radio show “Chio-kan Sakurai” Please check out the program here. 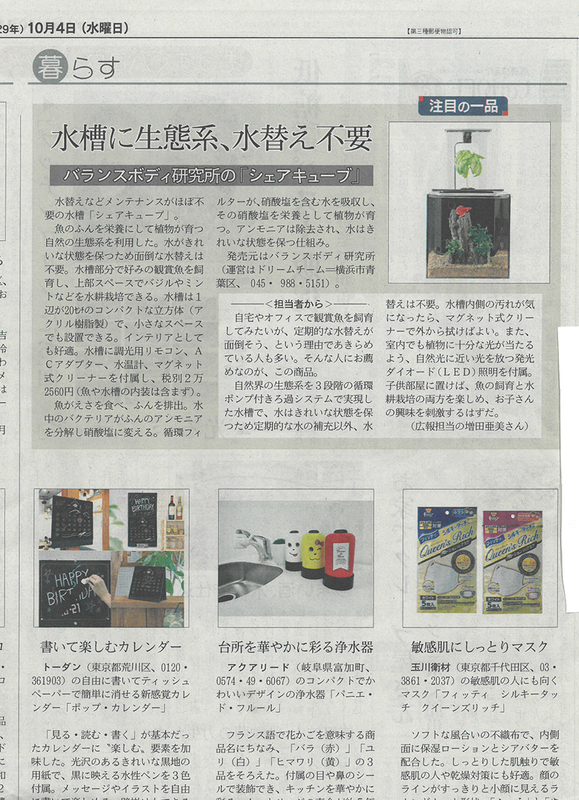 On 2018/10/22 our “Electric Circuit” was featured on Nikkei Marketing Journal News Paper. 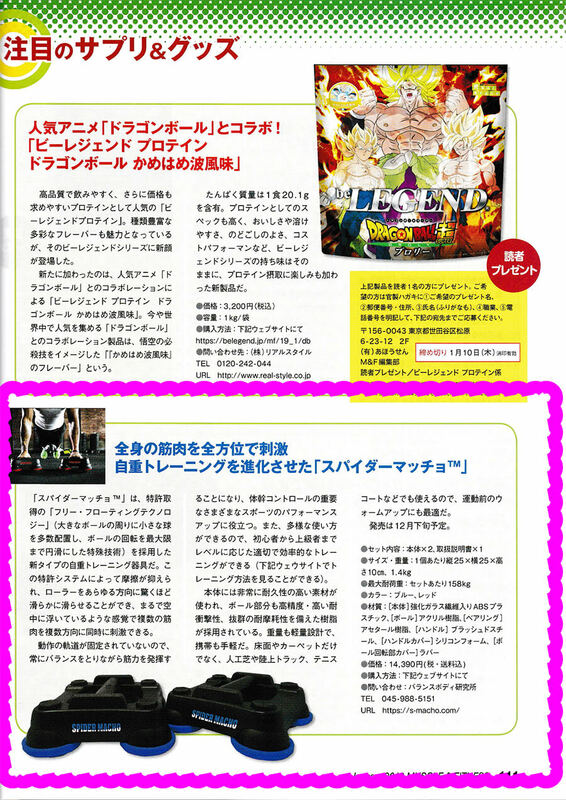 Please check the article here. 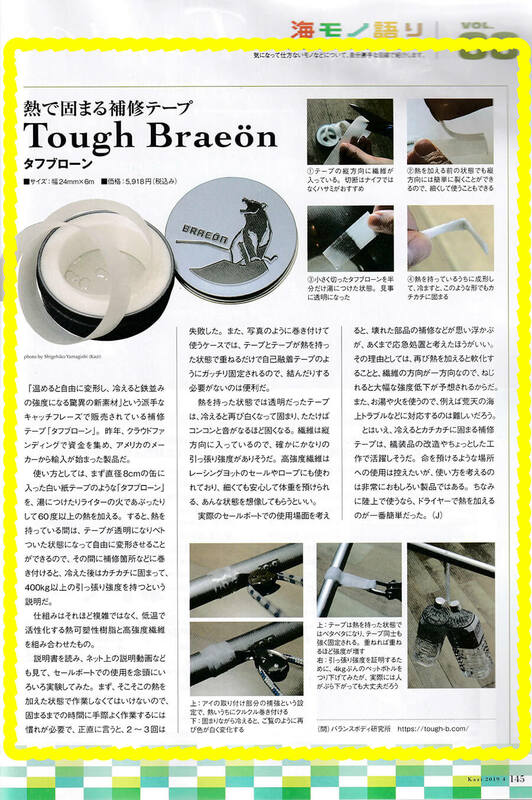 2018/10/1 our “ToughBraeon” was featured in “Field Life Lounge” magazine from Ei. 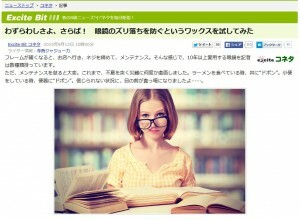 Please check the article here. 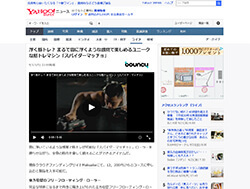 2018/9/17, our “Spider Macho” was featured on internet article “bouncy” by Viibar Inc. Also it was featured in “Yahoo Japan News”. Please check the article here. 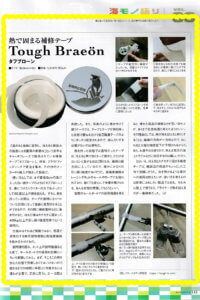 On 2018/9/13, our” ToughBraeon” was featured on “Nihon Ryustu Sangyo News Paper” Please check the article here. 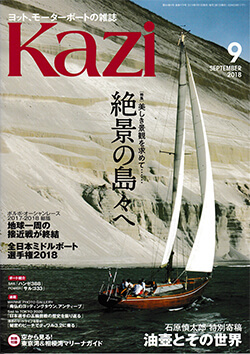 On 2018/9/5, our “ToughBraeon” was featured on magazine “KAZI” on Oct issue. Please check the article here. 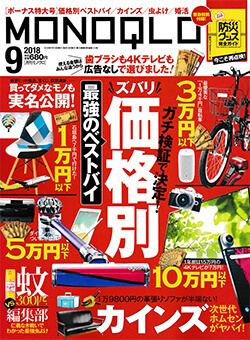 On 2018/9/1, our “Portable Camp Fire” was featured on magazine “mono magazine” from World Photo Press. Please check the article here. 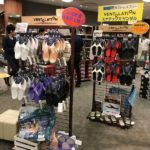 On 2018/8/24, our “Sand Removing Sandals” were featured in “Ohayou Nippon” from NHK. Please check out the program here. 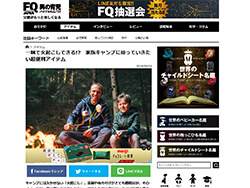 On 2018/8/16, our “Portable Camp Fire” was featured on internet article “FQ JAPAN Online” Please check out the article here. 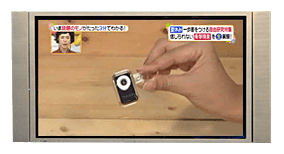 On 2018/8/10, our “iMicron” was featured on TV show “Hirunandesu!” by Nippon TV. Please check out the program here. 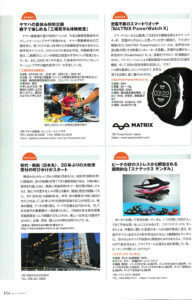 On 2018/8/10, our “Sand Removing Sandals” were featured in “HOT WATER SPORTS MAGAZINE” from Edge Inc. Please check out the article here. 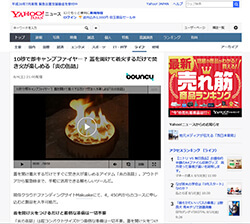 On 2018/8/4, our “Portable Camp Fire” was featured in internet article “bouncy” by Viibar Inc. Also it was featured on Yahoo Japan News. Please check the article here. 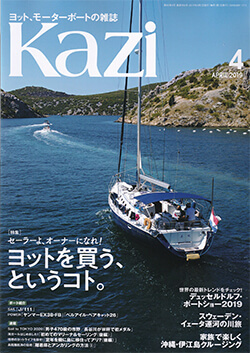 On 2018/8/3, our “Sand Removing Sandals” were featured on “Kazi” magazine. 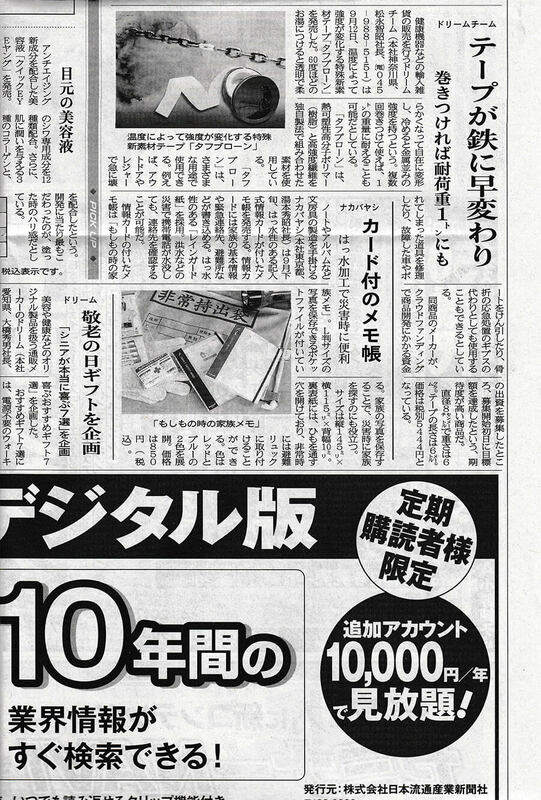 Please check the article here. 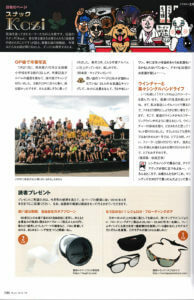 On 2018/8/3, our “Sand Removing Sandals” were featured on “Boat Club” magazine September issue. Please check out the article here. 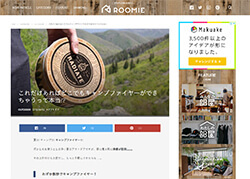 On 2018/8/2, our “Portable Camp Fire” was featured on “OUT DOOR” from “ROOMIE” by Mediagene Inc. Please check out the article here. 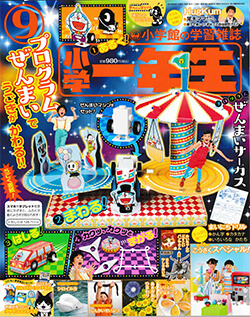 On 2018/8/1, our “Electric Circuit 3D” was featured in “Shougaku Ichinensei” September issue from Shogakukan. Please check out the article here. 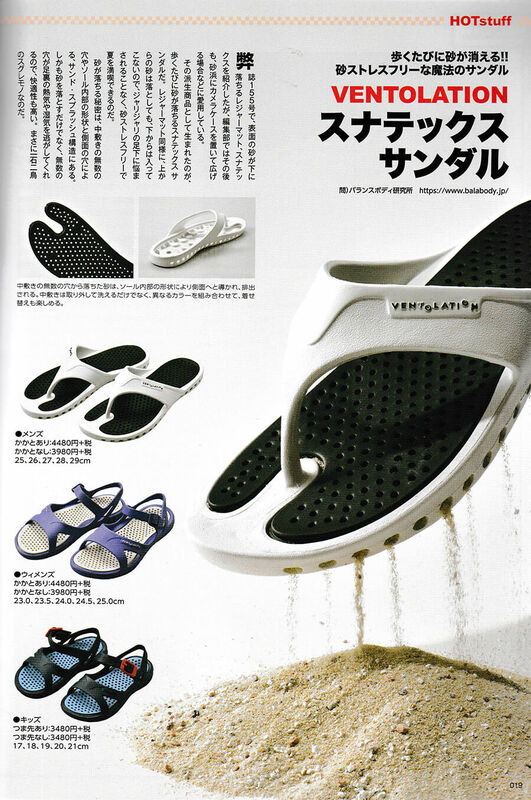 On 2018/7/30, our “Sand Removing Sandal” was featured in Nikkei Marketing Journal. Please check out the article here. On 2018/7/24, our “Sand Removing Sandal” was featured in a radio program on “Kitano Makoto No Zubari” on “CBC Radio”. Please check out the station here. On 2018/7/20, our “Sand Removing Sandal” was featured in a morning program ”ZIP” by “Nihon TV” Please check out the program here. On 2018/7/19, our “Sand Removing Sandal” was featured in a monthly magazine “MONOQLO” September issue by Shinyusha. 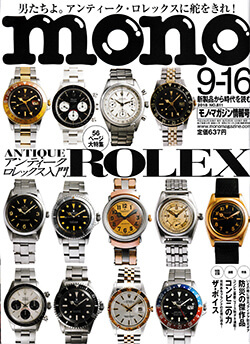 Please check the articles here. 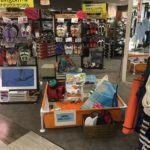 On 2018/7/16, our “Sand Removing Sandal” was featured on a morning radio program Next Focus, “Chokan Skurai” by HBC. Please check out the program here. 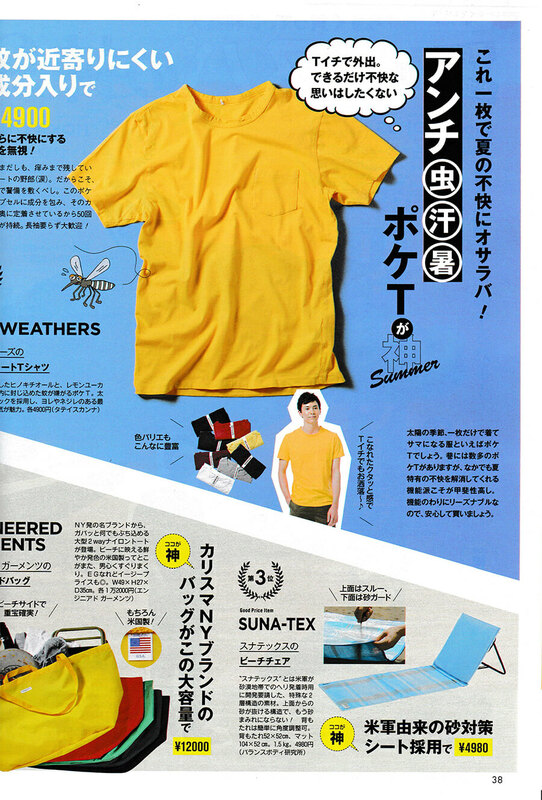 On 2018/7/12, our “Durable Pocket Blanket” was featured on a monthly magazine “LaLa Begin” August/September issue by “Seikaibunkashya” Please check out the article here. 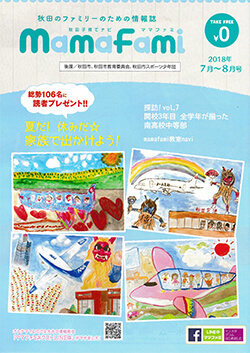 On 2018/7/12, our “Electronic Circuits 3D” was featured on a monthly magazine “Shogaku Hachinensei” summer issue. Please check out the article here. 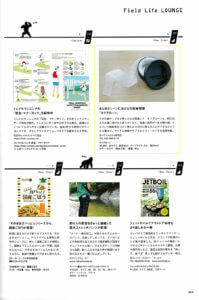 On 2018/7/6, our “Sand Removing Bag” was featured on a monthly magazine “Monthly Goods Press” August, September issue. Please check out the article here. 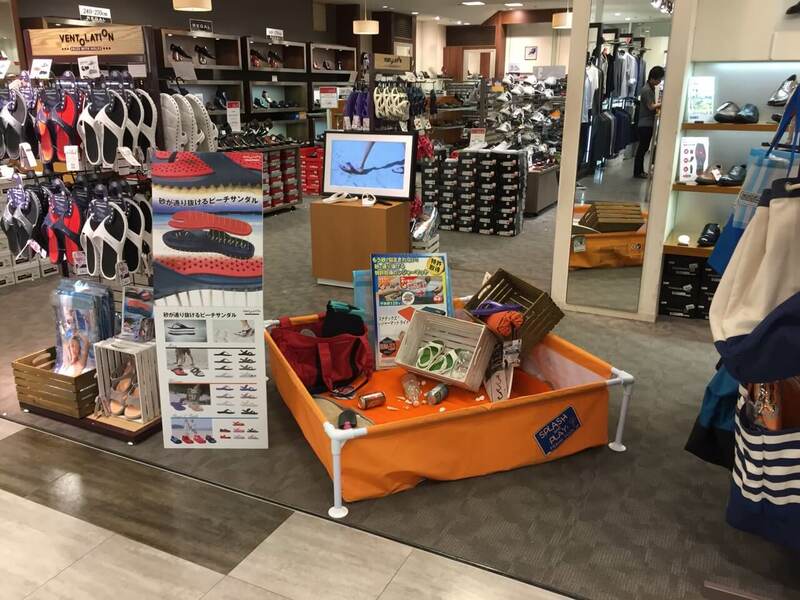 On 2018/7/5~2018/7/15, we did Demo for “Sand Removing Sandals” at Marui City 7th floor Men’s shoes section. We had a lot of visitors including those who read our e-mail magazine and who saw us on TV. Thank you all for visiting us. 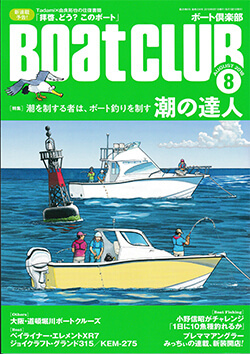 On 2018/7/5, our “Tough Braeon” was featured on a monthly magazine “Boat Club” August issue. Please check out the articles here. 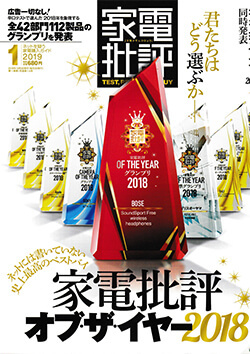 On 2018/7/4, our “ToughBraeon” was featured on “Nikkei Marketing Journal”. Please check out the articles here. 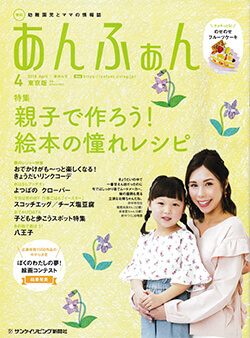 On 2018/6/30, our “Quick Shoelace” was featured on a magazine “mamafai” July~August issue. Please check out the articles here. 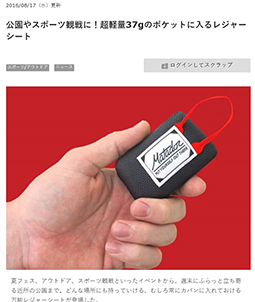 On 2018/6/29, our “Quick Shoelace” was featured on “Asahi Shinbun”. 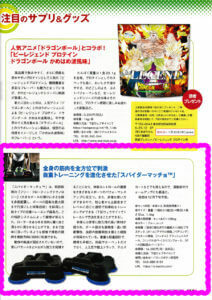 Please check the article here. 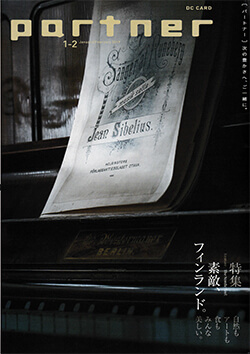 On 2018/6/25, our “Meaural” was featured on a monthly magazine “Geijyutsu Shinchou” July issue by “Shinchosha”. Please check out the article here. 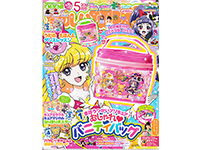 On 2018/6/21, our “Tough Braeon” was featured on a website “boucy” Products. 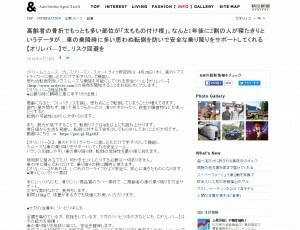 Also it was featured on “Yahoo Japan News”. Please check out the article here and here. 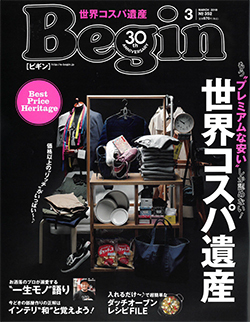 On 2018/6/15, our “Sand Removing Chair” was featured on a monthly magazine “Begin” August issue. Please check out the article here. 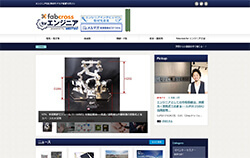 On 2018/6/11, our “ToughBraeon” was featured on website “fabcross” news, run by Meitec. Please check out the article here. 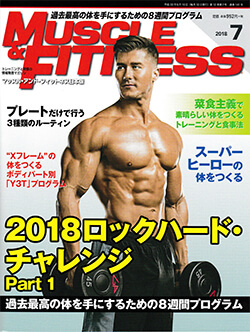 On 2018/6/10, our “Handy Muscle Builder Assist” was featured on a monthly magazine “Muscle and Fitness” July issue. Please check out the article here. 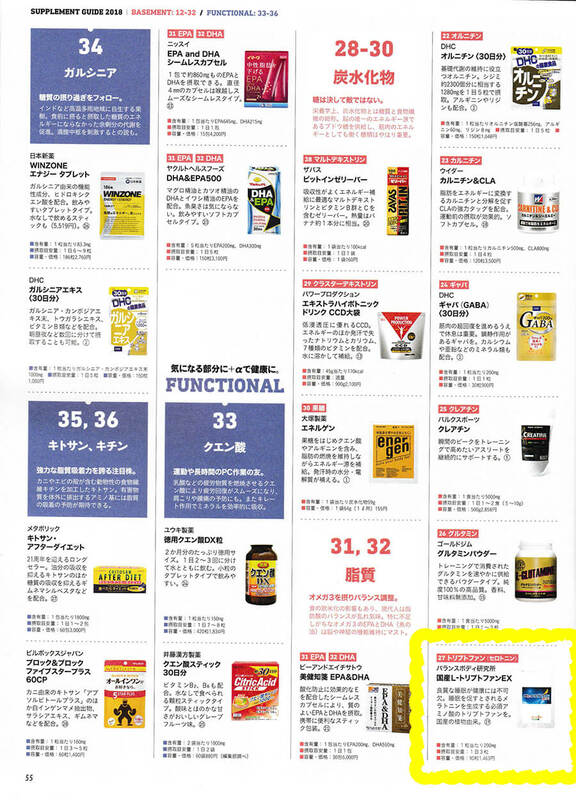 On 2018/5/23, our “Handy Muscle Builder Assist” was featured on “Nikkei Marketing Journal”. Please check out the article here. 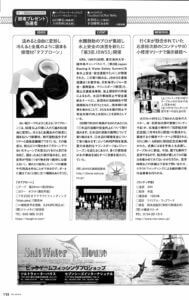 On 2018/5/10, our “Meaural” was featured on "Nihon Ryutsu Sangyo Shimbun". Please check out the article here. On 2018/5/1, our “Quick Shoelace” was featured on a monthly magazine “Chao” June issue. Please check out the article here. 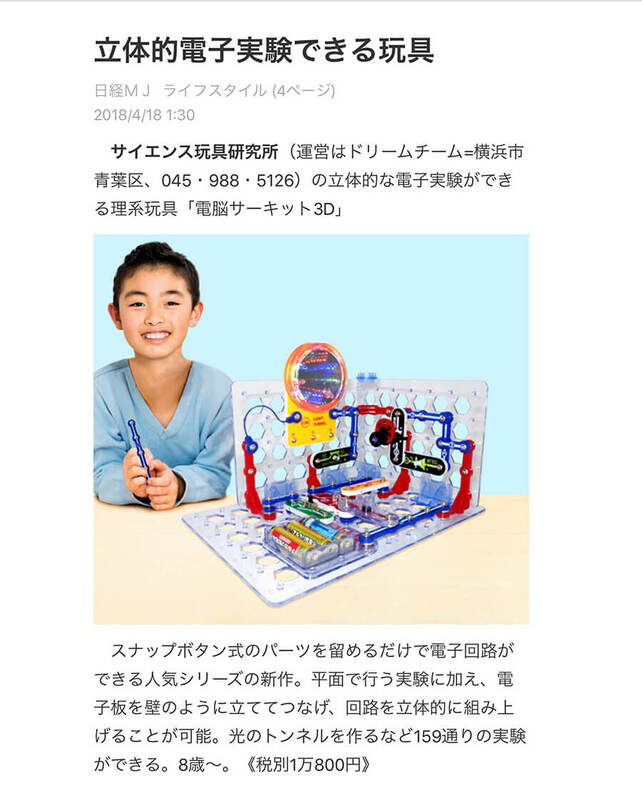 On 2018/4/18, our “Electronic Circuits 3D” was featured on a “Nikkei MJ”. Please check out the article here. 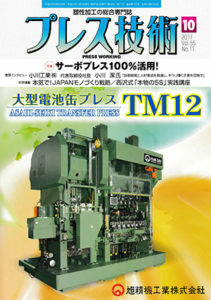 On 2018/4/28, our “Electronic Circuits” was featured on a monthly magazine “Shogaku Ichinensei” June issue. Please check out the article here. 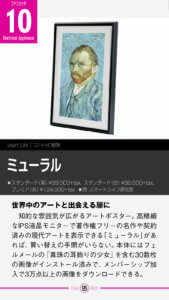 On 2018/4/24, our “Meural” was featured during a show “Trend Tamago” on TV Tokyo WBS. Please check out the article here. 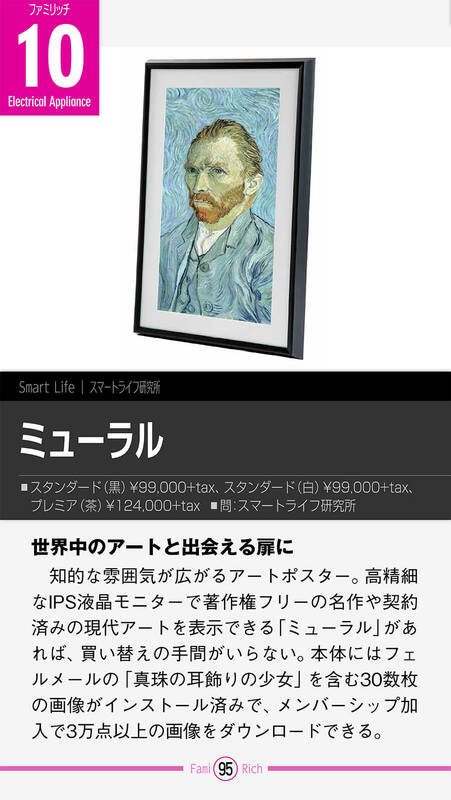 On 2018/4/22, our “Meural” was featured on a website “bouncy” run by “Viibar”. 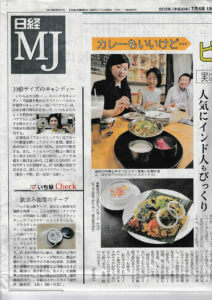 Also it was featured in “Yahoo News Japan”. Please check out the article here and here. 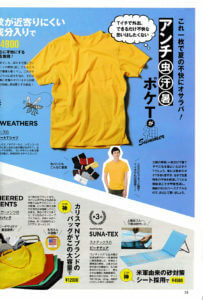 On 2018/4/19, our “Quick Shoelace” was featured on a monthly magazine “Shogaku 8 Nensei” summer issue. Please check out the article here. 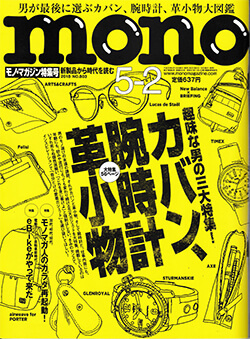 On 2018/4/16, our "Electronic Circuits 3D" was featured on a monthly magazine “mono magazine” May issue by World Photo Press. Please check out the article here. 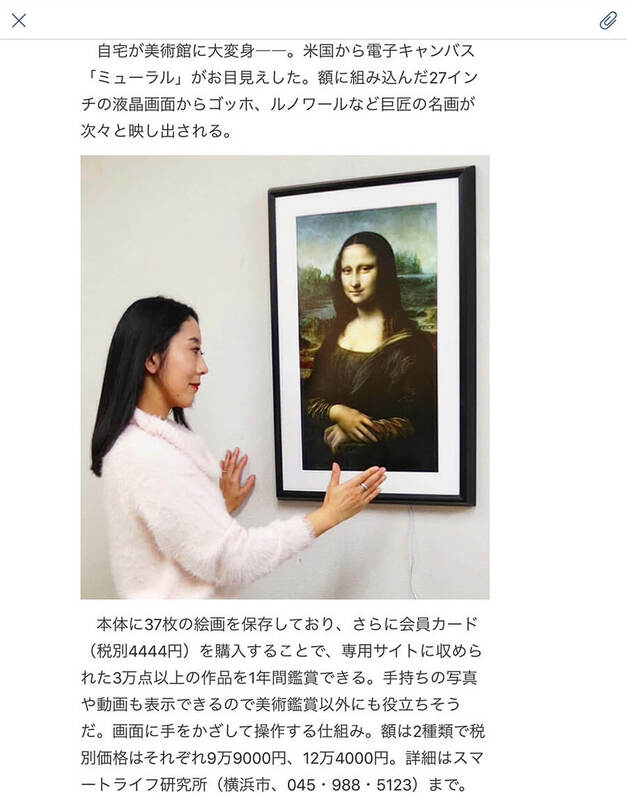 On 2018/4/17, our “Meural” was featured on website “moovoo” run by” Asahi Shinbun”. Please check out the article here. 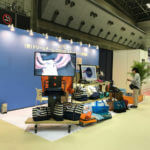 On 2018/4/4~4/6, 5th International Shoes Expo Spring was held in Fashion World Tokyo 2018 spring. 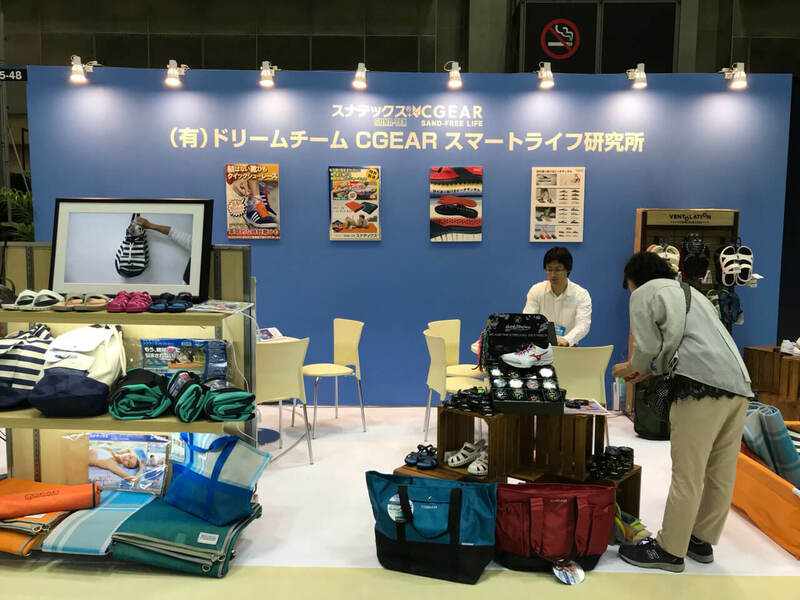 We displayed “Sand Removing Sandal” and “Quick ShoeLace” at the exhibition. We have met a lot of companies. Thank you so much for visiting us! 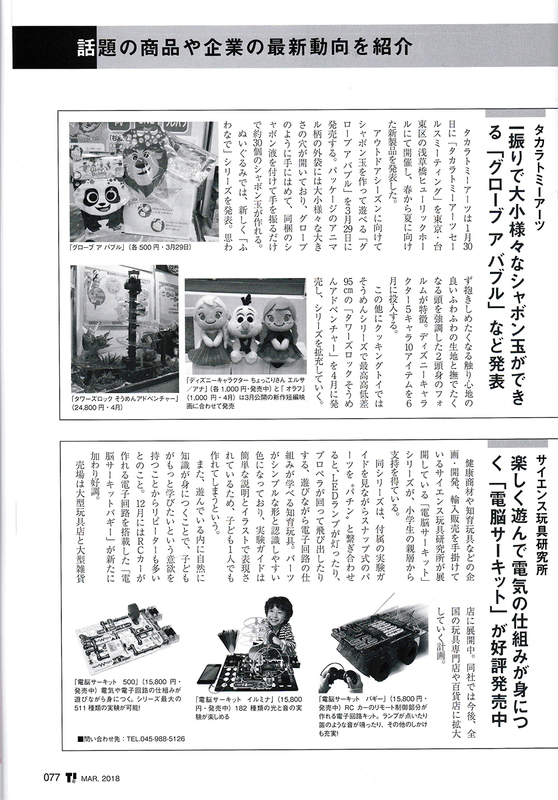 On 2018/3/29, our "Electronic Circuits" was featured on "Yomiuri KODOMO Shimbun". Please check out the article here. On 2018/3/23, our "QuickShoeLace" was featured as a useful tool with holes on a popular NHK morning show. On 2018/3/17, "Balanced Body Institute" was featured on a popular morning show of NIPPON TV. Please check it here. 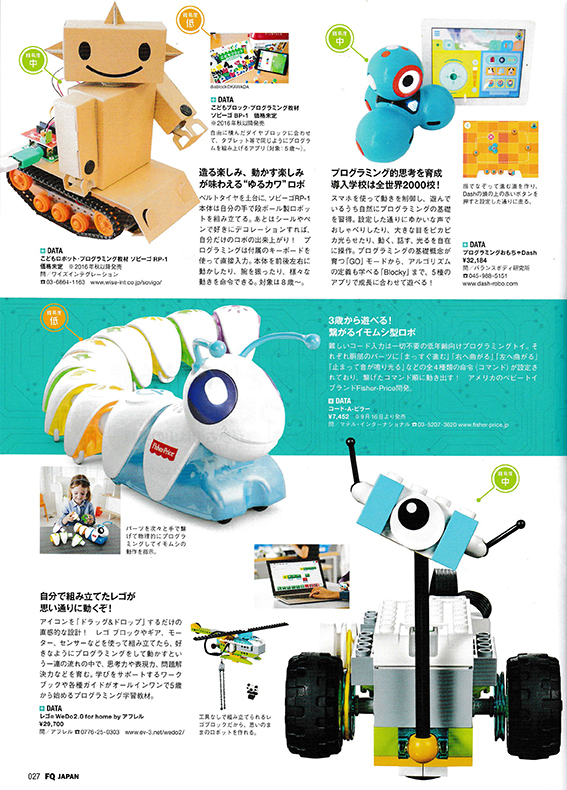 On 2018/3/9, our "Dash" was featured on a monthly magazine "Enfant" April issue by SANKEI LIVING SHIMBUN. Please check out the article here. On 2018/3/7, our "QuickShoeLace" was featured on a HBC morning TV show. Please check it here. On 2018/3/2, our "Dash" was featured as an educational material by Non-profit organization "Canvas" which advocates computer science for all. Please check it out here. 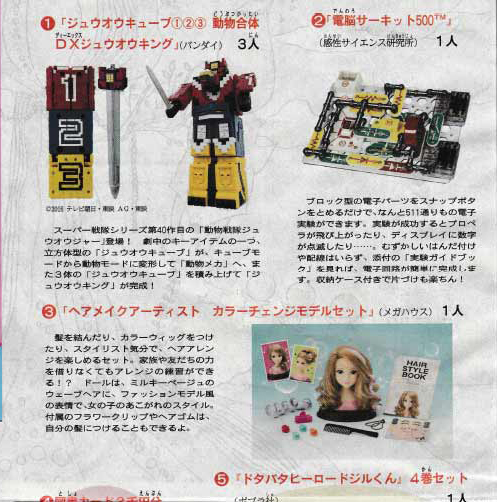 On 2018/3/2, our "Electronic Circuits" series were featured on a monthly magazine "Toy Journal" March issue. Please check out the article here. 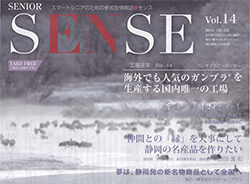 On 2018/2/28, our "Sleep Inducer" was featured on a newspaper called "SENSE". Please check out the article here. 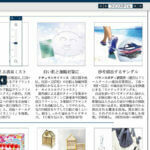 On 2018/2/28, our "QuickShoeLace" appeared on an article on Nikkei Marketing Journal. Please check out the article here. 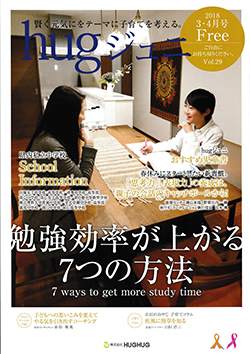 On 2018/2/20, our "Gent-Light Desk Top Lights" was featured on a monthly magazine "Hug Juni" February issue. Please check out the article here. 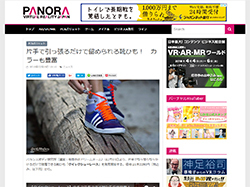 On 2018/2/19, our "QuickShoeLace" was featured on "Panora" an website for promoting VR. Please check out the article here. 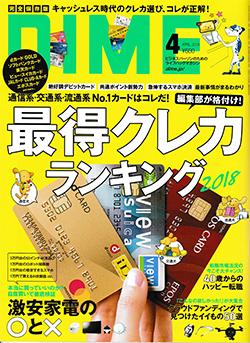 On 2018/2/16, our "Sand Removing Mat" was featured on a monthly magazine "DIME" April issue. Please check out the article here. 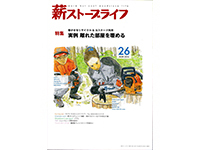 On 2018/2/15, our "Electronic Circuits 300" was featured on a monthly magazine "Shogaku 8 Nensei" 6th issue. Please check out the article here. 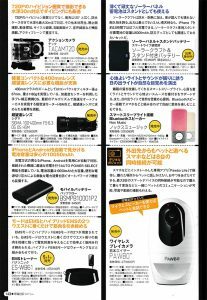 On 2018/2/2, our "The Micro+" was featured on a monthly magazine "mono magazine" March issue. Please check out the article here. 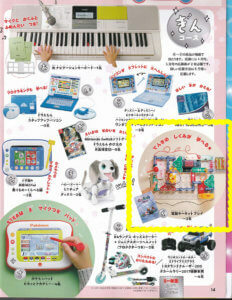 On 2018/2/1, our "Electronic Circuits" was featured on a monthly magazine "TV magazine" March issue. Please check out the article here. On 2018/1/27, our "Anti-Slip Glasses Wax" was featured during an evening show "Ameagari no Nanimon!?" on Kansai Telecasting Corporation. 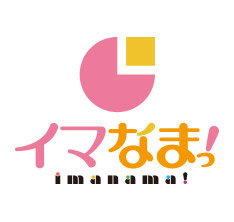 On 2018/1/22, our "Electric Shoe Polisher" was featured during a morning show "ImaNama!" on RCC Broadcasting. 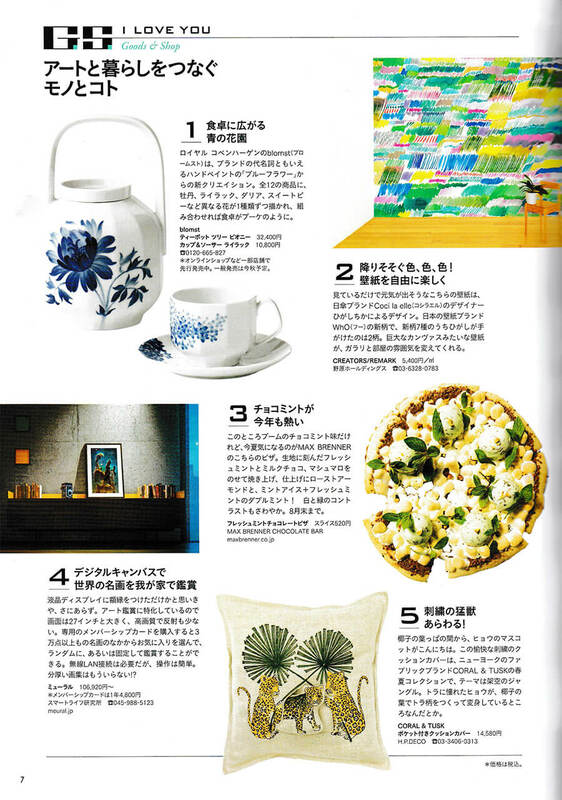 On 2018/1/16, our "Rusuneko Box" and "Meural" were featured on a monthly magazine "Begin" March issue. Please check out the article here. 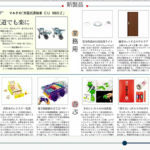 On 2018/1/10, our "Electronic Circuits Buggy" appeared on an article on Nikkei Marketing Journal. Please check out the article here. 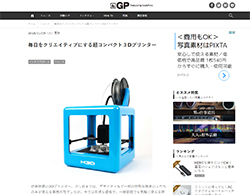 On 2018/1/9, our "The Micro+" was featured on "&GP", the website managed by Tokuma Shoten Publishing. Please check out the article here. 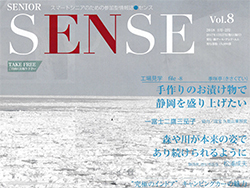 On 2017/12/27, our "Car Assist Handle" was featured on a newspaper called "SENSE". Please check out the article here. 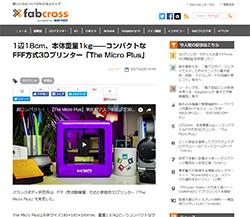 On 2017/12/8, our "The Micro+" was featured on "Fabcross". Please check out the article here. 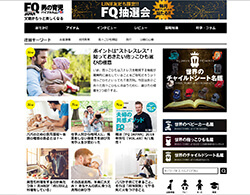 On 2017/12/8, our "QuickShoeLace" was featured on "FQ Japan". Please check out the article here. 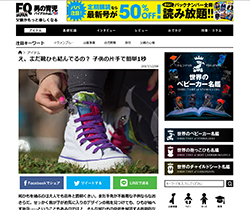 On 2017/12/6, our "QuickShoeLace" was featured on "moovoo", the website managed by The Asahi Shimbun. Please check out the article here. 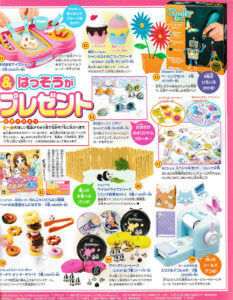 On 2017/12/1, our "Rusuneko Box" was featured on a monthly magazine called "Orange Page" December issue. Please check out the article here. 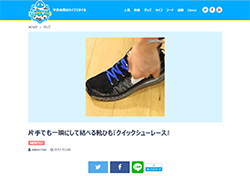 On 2017/11/24, our "QuickShoeLace" was featured on "&GP", the website managed by Tokuma Shoten Publishing. Please check out the article here. 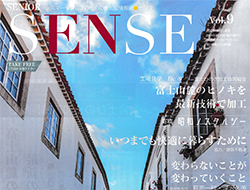 On 2017/11/16, our "ShareQube" was featured on a newspaper called "SENSE". Please check out the article here. On 2017/11/13, our "Cafebrella" was featured during an evening show "Sekai marumie! 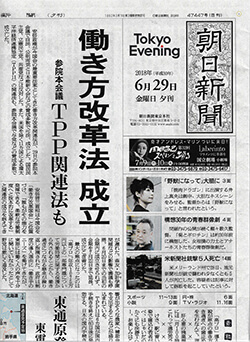 TV-tokusobu" on Nippon Television. On 2017/10/21, our "Hair Fixing Cap" was featured during a morning show "Pikachin Hunter" on Tokyo Television. 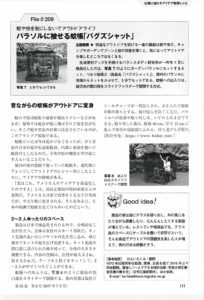 On 2017/10/19, our "Smaphorium" was featured on a newspaper called "Nihon Ryutsu Sangyo Shimbun". Please check out the article here. 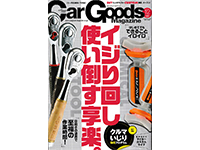 On 2017/10/13, our "Car Assist Handle" was featured on "Kakaku.com Magagine", the web magazine of a famous comparison site. Please check out the article here. 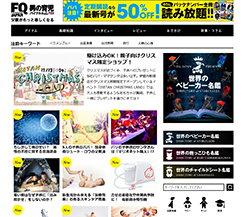 On 2017/10/4, our "ShareQube" appeared on an article on Nikkei Marketing Journal. Please check out the article here. On 2017/9/26, our "KnockOut Abs" was featured during an evening show "Marushare" on Shizuoka Daiichi Television. 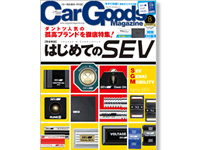 On 2017/9/16, our "SolarCraft" was featured on a monthly magazine called "Car Goods Magazine" November issue. Please check out the article here. 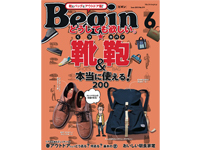 On 2017/9/16, our "Rusuneko Box" was featured on a monthly magazine called "Begin" November issue. Please check out the article here. 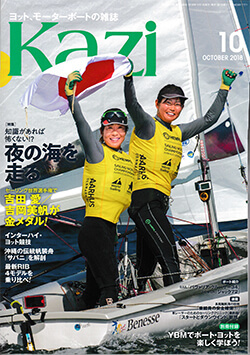 On 2017/9/8, our "SolarCraft" was featured on a monthly magazine called "Press Working" October issue. Please check out the article here. 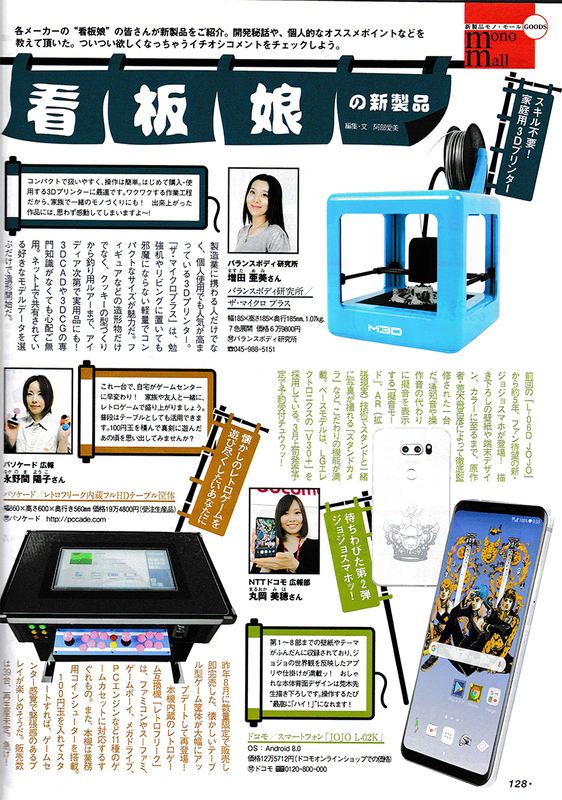 On 2017/9/5, our "iMicroscope" was featured on a quarterly magazine called "AERA with Kds" Septemeber issue. Please check out the article here. 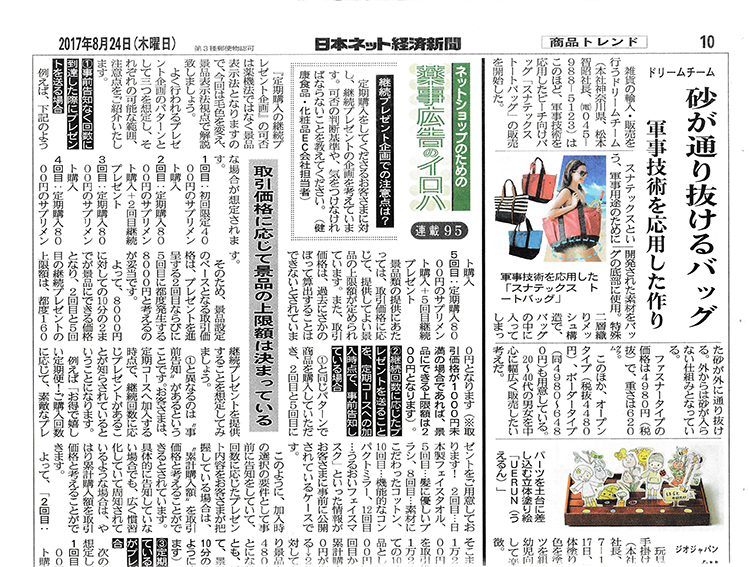 On 2017/8/24, our "Sand Removing Bag " was featured on a newspaper called "Nihon Net Keizai Shimbun". Please check out the article here. 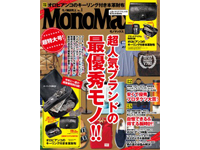 On 2017/8/16, our "Sand Removing Bag" was featured on a monthly magazine called "mono magazine" Septemeber issue. Please check out the article here. 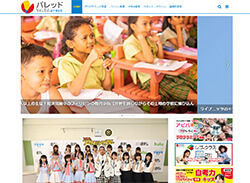 On 2017/8/14, our "Smaphorium" appeared on an article on Nikkei Marketing Journal. Please check out the article here. 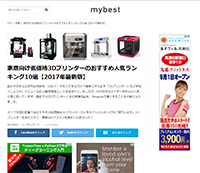 On 2017/8/9, "The Micro", "Alcohol Breathalyzer", "Memory Foam Pillow" and "iGuard5" were featured on a website called "mybest". Please check out one of the articles here. On 2017/7/30, our "Sand Removing Mat" was featured on a HBC morning TV show. 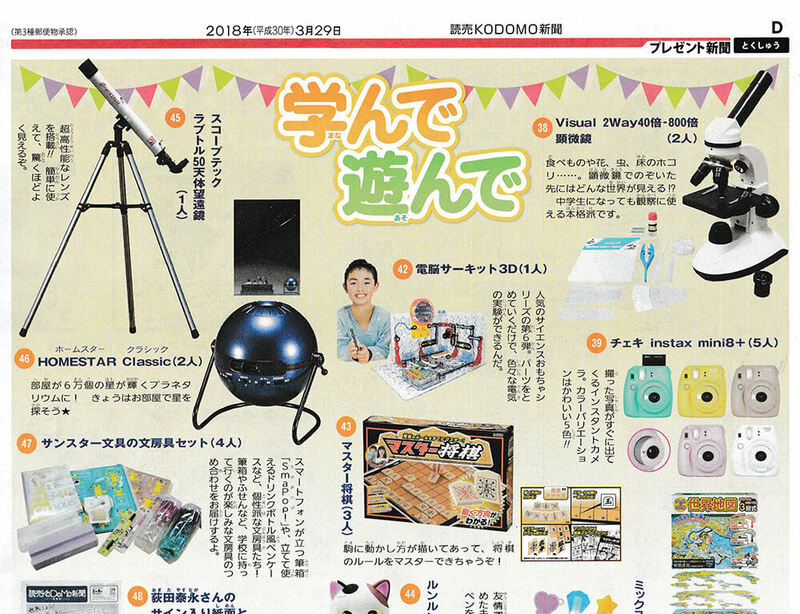 On 2017/7/20, our "iMicroscope" was featured on "Japan Information Mart", the website for the financial industry. Please check out the article here. 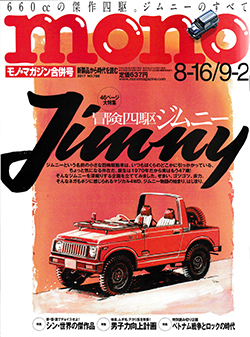 On 2017/6/30, our "iMicroscope" was featured on a monthly magazine called "mono magazine" July issue. Please check out the article here. 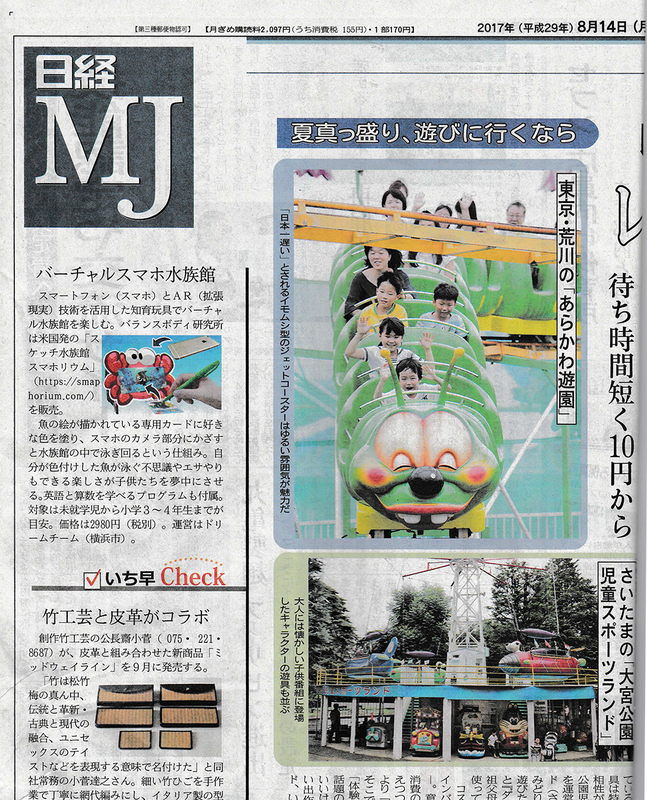 On 2017/6/22, our "iMicroscope" was featured on a newspaper called "Nihon Ryutsu Sangyo Shimbun". Please check out the article here. On 2017/6/21, our "Car Assist Handle" was featured as a useful car tool on a popular NHK morning show. 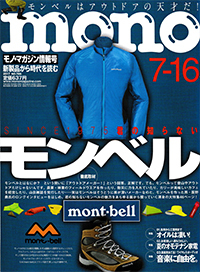 On 2017/6/16, our "ShareQube" was featured on a monthly magazine called "mono magazine" July issue. Please check out the article here. On 2017/6/15, our " iMicroscope" appeared on an article on Nikkei Marketing Journal. 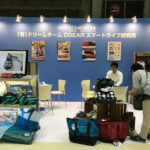 On 2017/6/13, our "Sand Removing Mat", "Trunk Baggage Keeper", "Umbrella Table Screen" were featured on a magazine called "Car goods Taizen". Please check out the article here. 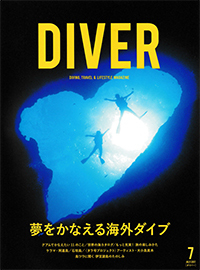 On 2017/6/9, our "Sand Removing Mat" was featured on a monthly magazine called "Diver" July issue. Please check out the article here. 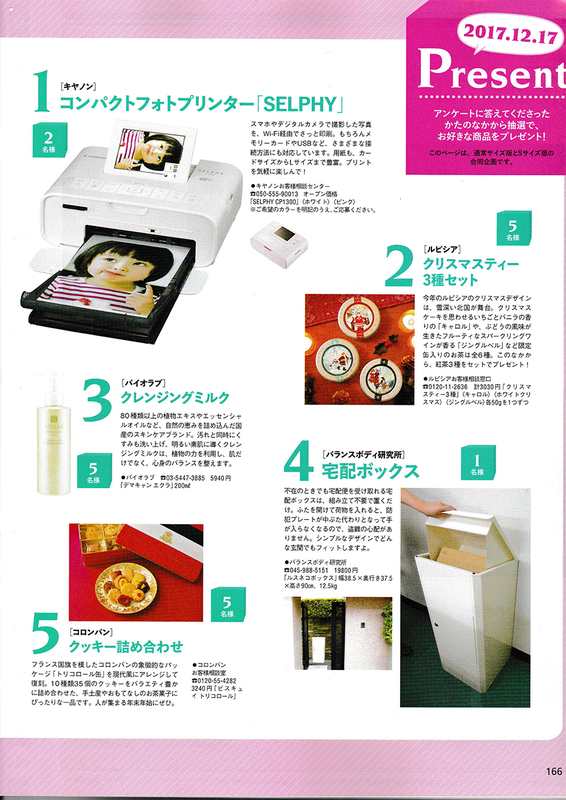 On 2017/6/8, our "Umbrella Table Screen" was featured on a monthly magazine called "Press Working" July issue. Please check out the article here. On 2017/5/6, our "Electric Shoe Polisher" was featured during a morning show on Yomiuri Telecasting. 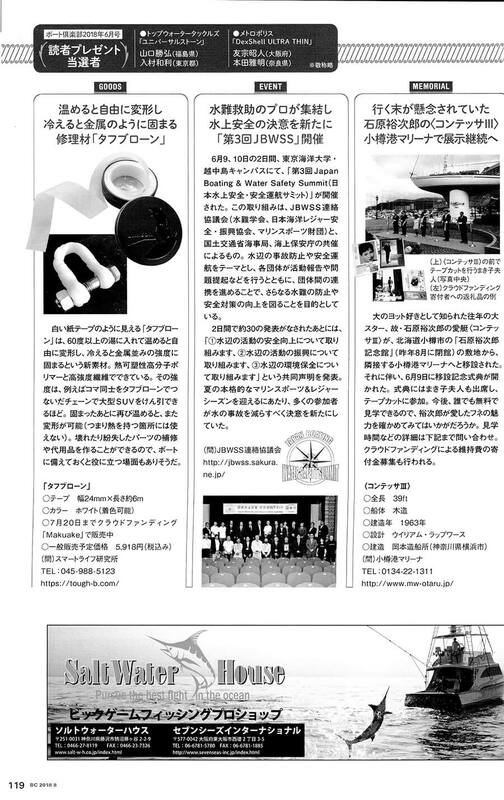 On 2017/5/2, our "SolarCraft" was featured on a monthly magazine called "Kadenhihyou" June issue. Please check out the article here. 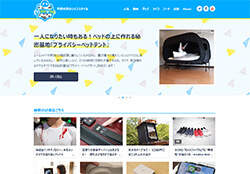 On 2017/4/22, "Sand Removing Bag & Chair" on Makuake was featured on "&GP", the website managed by Tokuma Shoten Publishing. Please check out the article here. 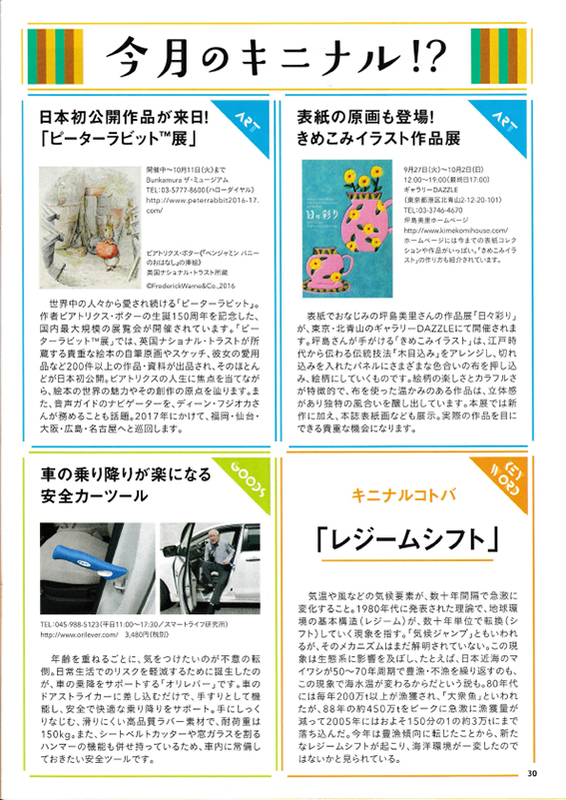 On 2017/4/12, our "Electronic Circuits Illumina" was featured on a monthly magazine called "PHP Nobi Nobi Kosodate" May issue. Please check out the article here. 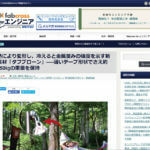 On 2017/4/12, our "KnockOut Abs" was featured on "Japan Information Mart", the website for the financial industry. Please check out the article here. 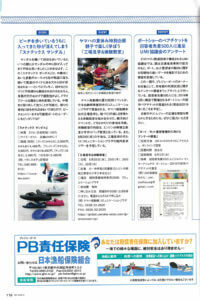 On 2017/4/10, our "Electric Shoe Polisher" appeared on an article on Nikkei Marketing Journal. 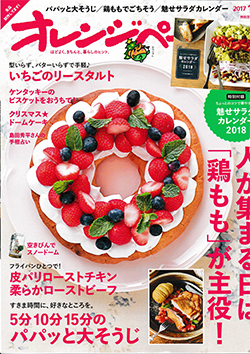 On 2017/4/3, our "KnockOut Abs" was featured on a monthly magazine called "Colorful" April issue. Please check out the article here. 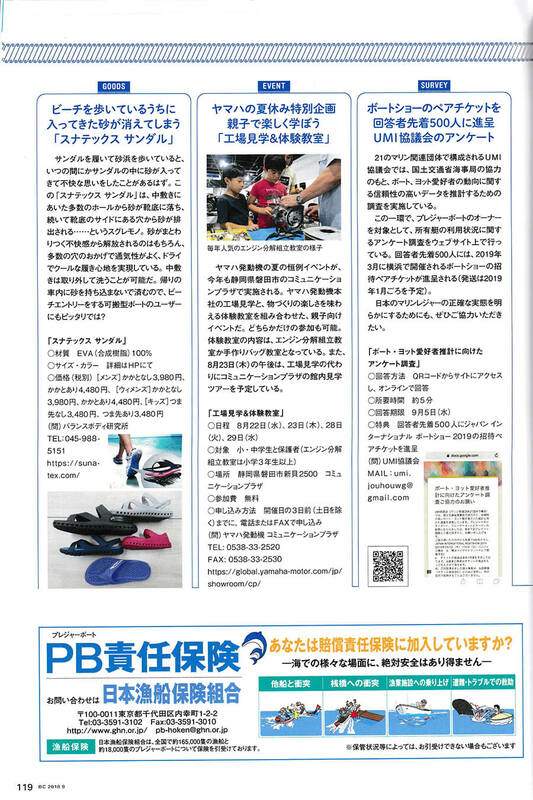 On 2017/3/16, our "Electric Shoe Polisher" was featured on a newspaper called "Nihon Ryutsu Sangyo Shimbun". Please check out the article here. 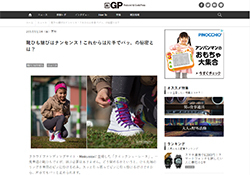 On 2017/3/8, "Electric Shoe Polisher" was featured on "&GP", the website managed by Tokuma Shoten Publishing. Please check out the article here. 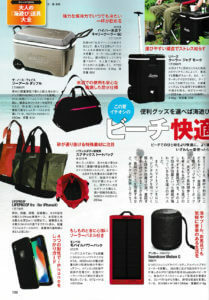 On 2017/2/26, our "Durable Pocket Blanket" was feature on "Travel+", the website managed by Japan Airlines. Please check out the article here. 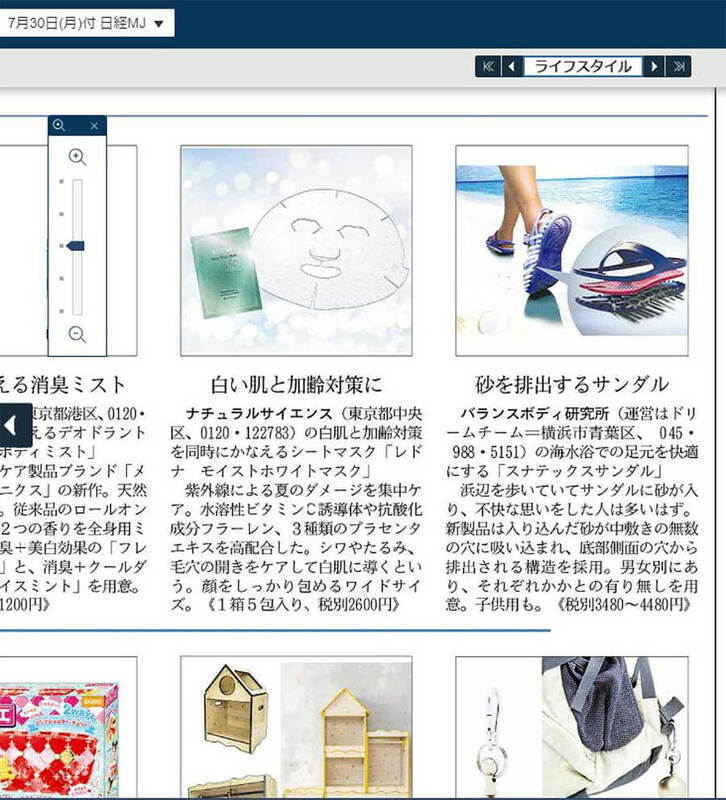 On 2017/2/27, our "Sleep inducer" was featured on "Japan Information Mart", the website for the financial industry. Please check out the article here. 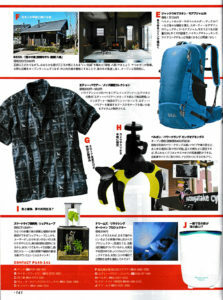 On 2017/2/24, our "Durable Pocket Blanket" was featured on a monthly magazine called "GetNavi" March issue. Please check out the article here. 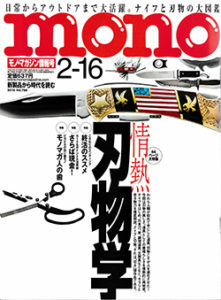 On 2017/2/16, our "Durable Pocket Blanket" was featured on a monthly magazine called "mono magazine" March issue. Please check out the article here. On 2017/2/15, our "Hair Fixing Cap" was featured on "Jiyu!da! 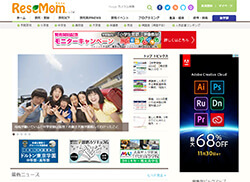 planet", the website managed by a member of the Sumitomo Mitsui Financial Group. On 2017/2/8, our "Sleep inducer" appeared on an article on Nikkei Marketing Journal. 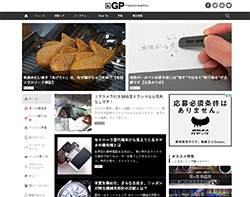 On 2017/2/1, "Video Stabilizer Stick" was featured on "&GP", the website managed by Tokuma Shoten Publishing. Please check out the article here. 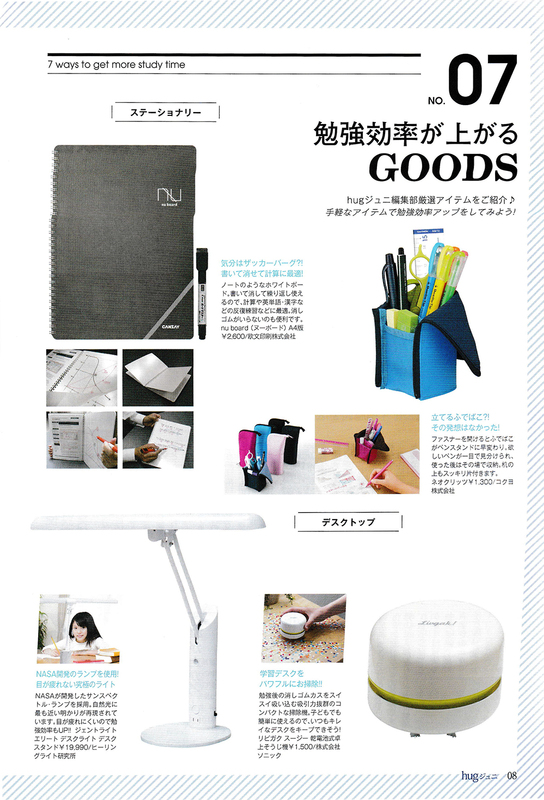 On 2017/1/16, our "Natural Light LED Desk Lamp" was featured on a monthly magazine called "DIME" March issue. Please check out the article here. 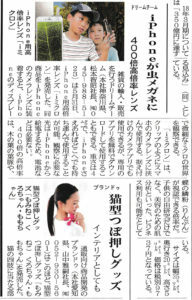 On 2017/1/1, our "Dash" was featured on a newspaper called "Asahi Student Newspaper". Please check out the article here. 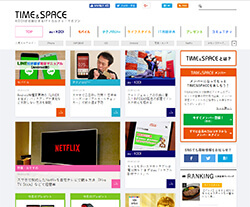 On 2016/12/28, our "The Micro" was featured on "Entame Plex". Please check out the article here. 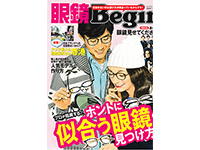 On 2016/12/16, our "Sleep inducer" was featured on a monthly magazine called "Begin" Feburary issue. Please check out the article here. 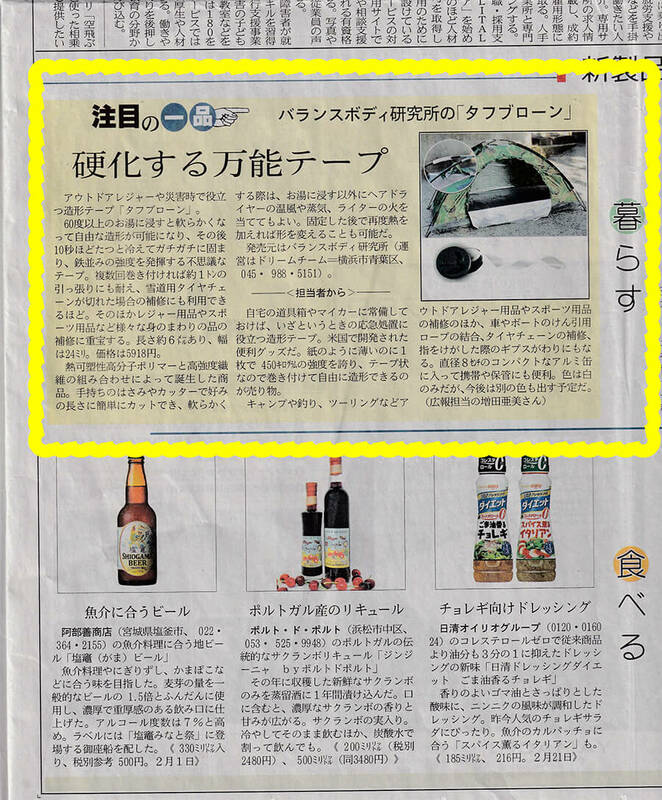 On 2016/12/15, our "Sleep Inducer" was featured on a newspaper called "Nihon Net Keizai Shimbun". Please check out the article here. 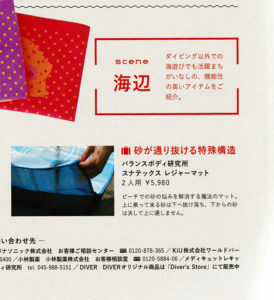 On 2016/12/15, our "Durable Pocket Blanket" was featured on a bimonthly magazine called "Bon Vivant" issued by National Central Society of Credit Cooperatives. On 2016/12/6, our "The Micro" was featured on a newspaper called "Nihon Ryutsu Sangyo Shimbun". Please check out the article here. 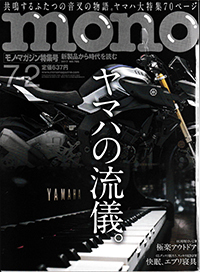 On 2016/12/16, our "The Micro" was featured on a monthly magazine called "mono magazine" December issue. Please check out the article here. 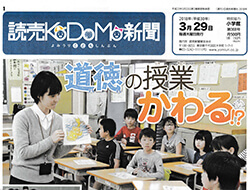 On 2016/11/24, our "The Micro" was featured on a newspaper called "Nihon Net Keizai Shimbun". Please check out the article here. 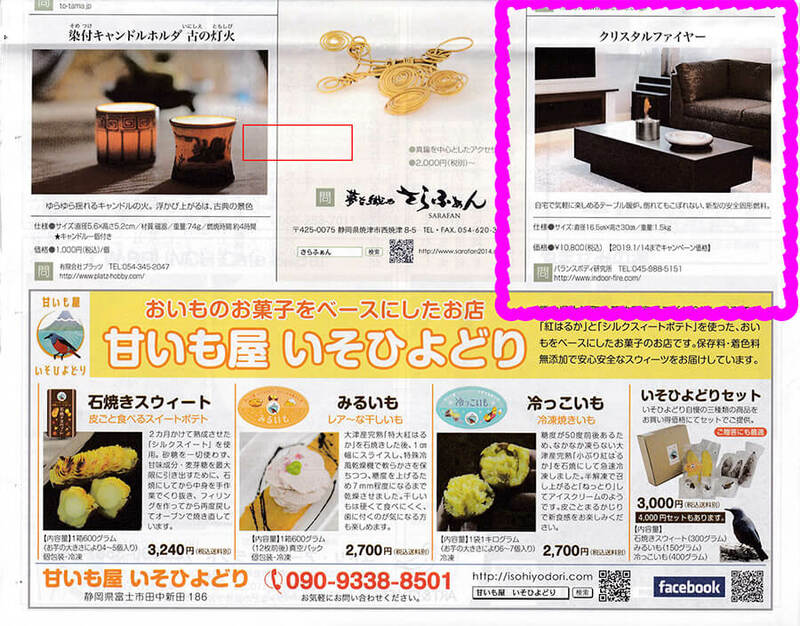 On 2016/11/23, our "Dash" and "Dot" appeared on an article on Nikkei Marketing Journal. 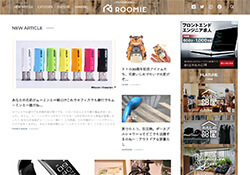 On 2016/11/10, our "Depression Therapy Lamp" was featured on "Rejob". Please check out the article here. 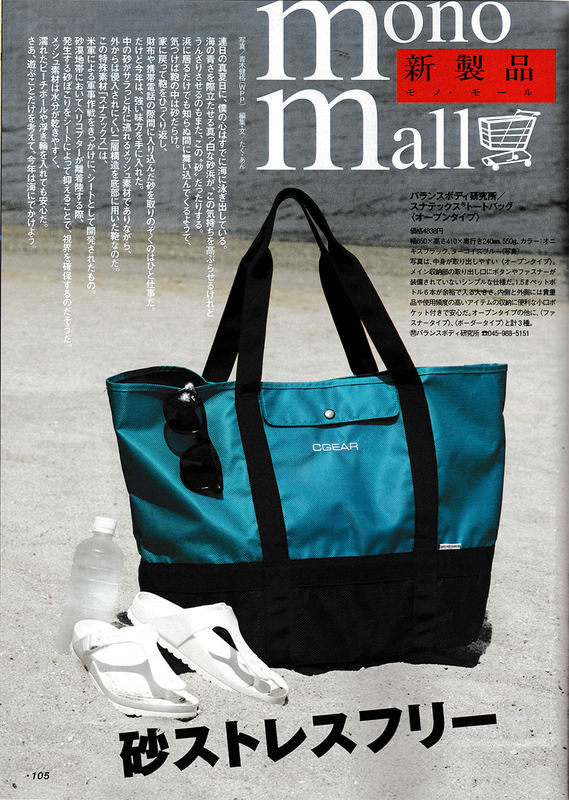 On 2016/11/10, our "Durable Pocket Blanket" was featured on a monthly magazine called "Beach Volley Style" October issue. Please check out the article here. 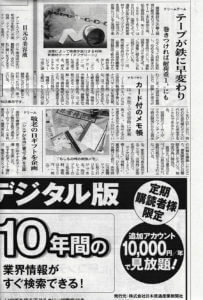 On 2016/11/7, our "The Micro" appeared on an article on Nikkei Marketing Journal. On 2016/10/15, our "Durable Pocket Blanket" was featured during an evening show "Moshimo Tours" on Fuji Television. 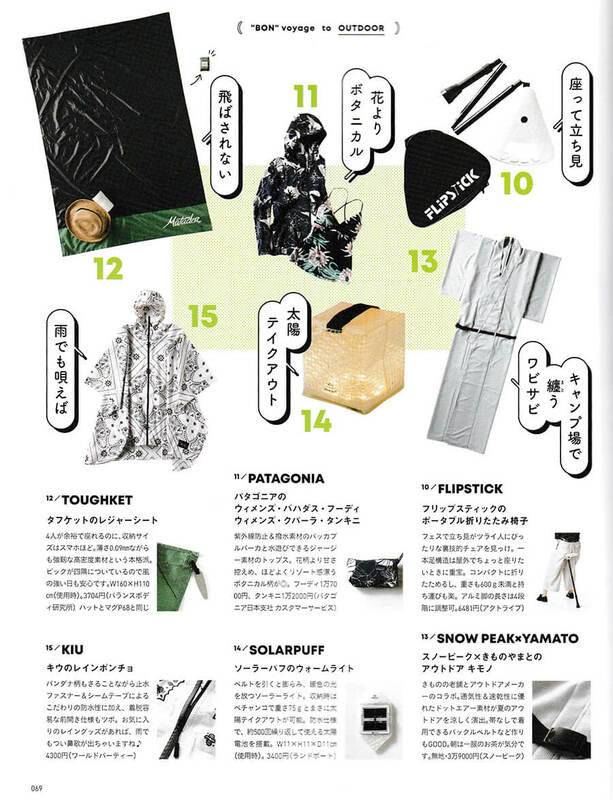 On 2016/10/10, our "Durable Pocket Blanket" was featured on a monthly magazine called "Popeye" November issue. Please check out the article here. 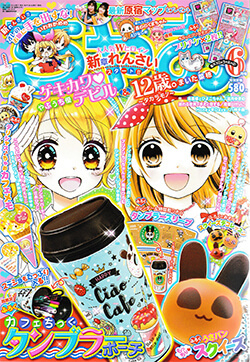 On 2016/10/5, our "Dash" and "Dot" were featured on "Excite bit". Please check out the article here. 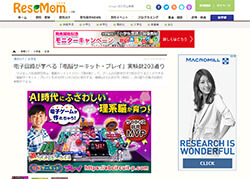 On 2016/10/5, our "Dash" and "Dot" were featured on "Risemom" the website for parents and teachers. Please check out the article here. 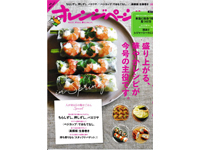 On 2016/10/1, our "Swim Tunes" was featured on a textbook for intermediate Japanese learners called "Marugoto: Japanese language and culture; intermediate". Please check out the page here. 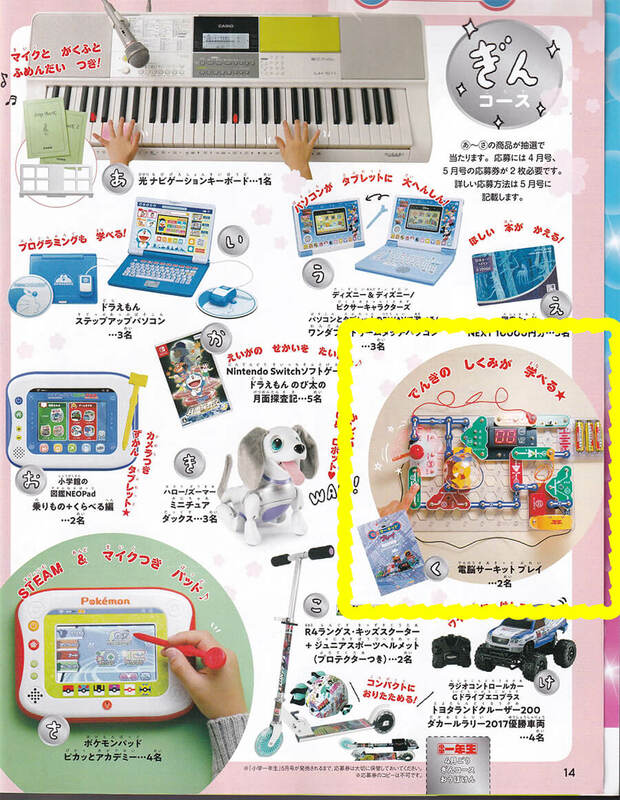 On 2016/10/1, our "Durable Pocket Blanket" was featured on a monthly magazine for pre-schoolers and kindergarteners called "Tanoshii Yochien" November issue. Please check out the article here. 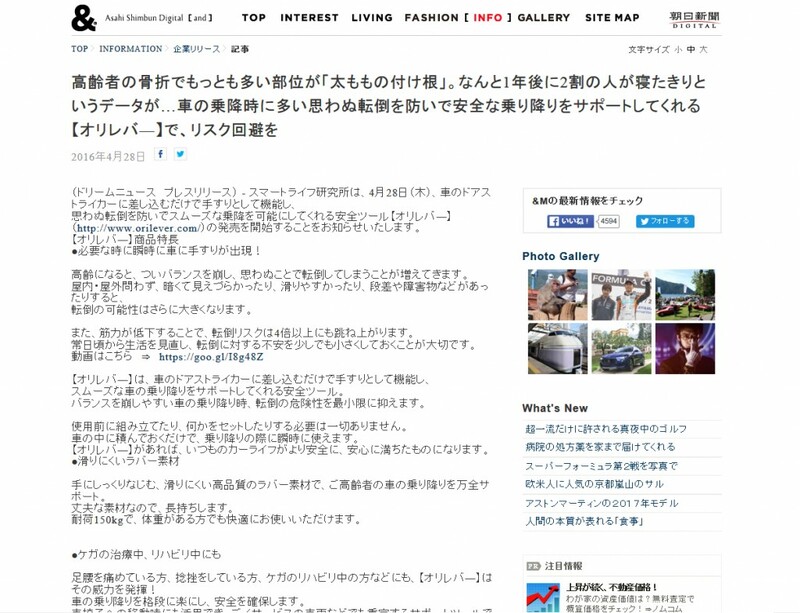 On 2016/9/30, our "Durable Pocket Blanket" was featured on "Real Style by Jeep", the website managed by FCA Japan. Please check out the article here. 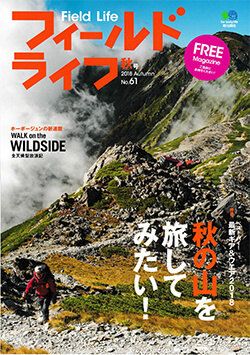 On 2016/9/30, our "Video Stabilizer Stick" was featured on a monthly magazine called "Nodule" November issue. Please check out the article here. 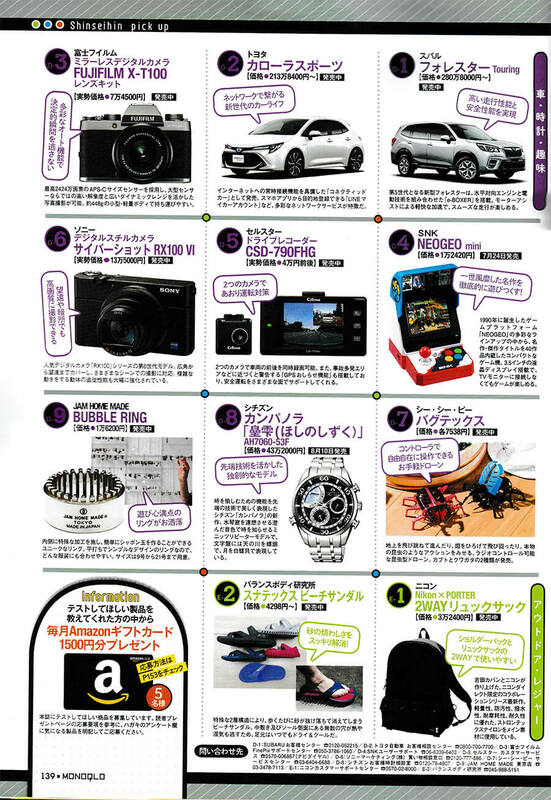 On 2016/9/17, our "Durable Pocket Blanket" was featured on a monthly magazine called "Car Goods Magazine" November issue. Please check out the article here. 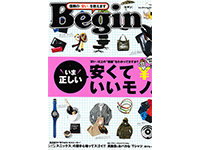 On 2016/9/16, our "Durable Pocket Blanket" was featured on a monthly magazine called "Begin" November issue. Please check out the article here. 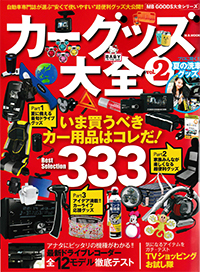 On 2016/9/1, our "Car Assist Handle" was featured on a monthly magazine called "Colorful" September issue. Please check out the article here. 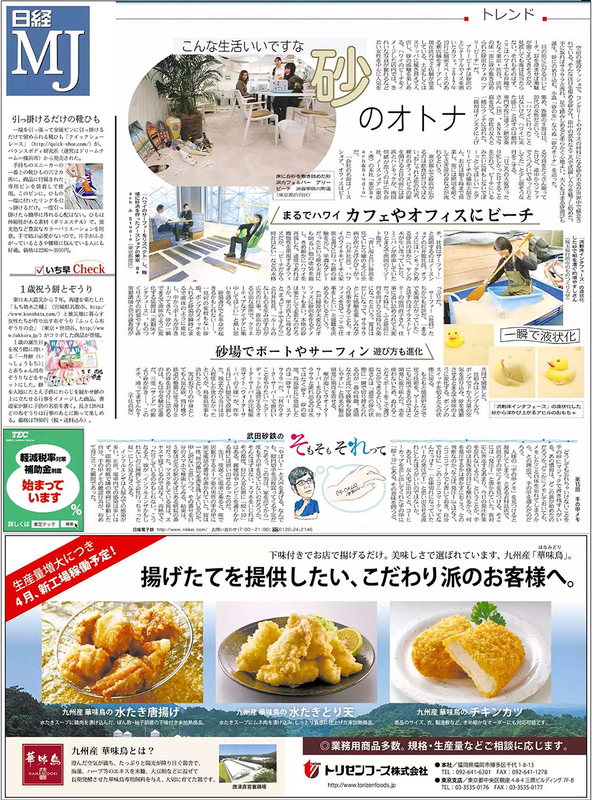 On 2016/9/1, our "Video Stabilizer Stick" was featured on a newspaper called "Nihon Net Keizai Shimbun". Please check out the article here. On 2016/9/1, our "Dash" was featured on a quarterly magazine called "FQ Japan" Fall issue. Please check out the article here. 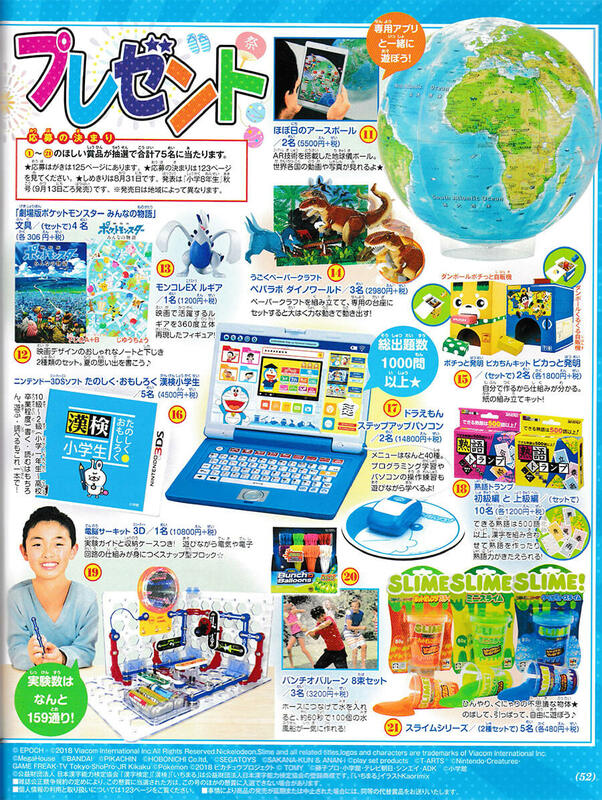 On 2016/8/19, "Sand Removing Mat" and "BeachSafe" were featured on "Otameshi Navi", the website featuring latest products. Please check out the article here. On 2016/8/19, our "BeachSafe" was featured during an evening show "Marugoto" on Shizuoka Daiichi Television. 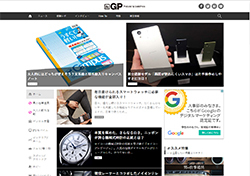 On 2016/8/17, "Durable Pocket Blanket" was featured on "&GP", the website managed by Tokuma Shoten Publishing. Please check out the article here. On 2016/8/6, our "Sand Removing Mat" was featured during a morning show on Yomiuri Telecasting. On 2016/8/2, our "Anti-Slip Glasses Wax" was featured during a popular evening quiz show on Fuji Television. On 2016/7/31, our "Sand Removing Mat" was featured on a monthly magazine called "Beach Volleyball Style Magazine" July issue. Please check out the article here. On 2016/7/29, our "Moving Straps" was featured during a late night show on Chukyo Television. 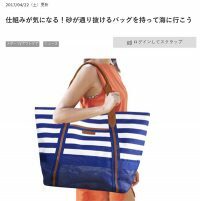 On 2016/7/28, our "BeachSafe" appeared on an article on Nikkei Marketing Journal. On 2016/7/19, our "Sand Removing Mat" was featured during a popular evening quiz show on Fuji Television. On 2016/7/18, our "Sand Removing Mat" was featured as a useful beach goods on a popular NHK morning show. On 2016/7/12, our "Car Assist Handle" was featured during a popular evening quiz show on Fuji Television. On 2016/7/10, our "Sand Removing Mat" was featured on a monthly magazine called "Hot Water Sports Magazine" August issue. Please check out the article here. On 2016/6/29, our "Umbrella Table Screen" was featured as a useful outdoor goods on a popular NHK morning show. 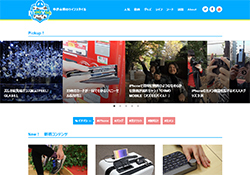 On 2016/6/25, "Car Assist Handle" was featured on "Otameshi Navi", the website featuring latest products. Please check out the article here. On 2016/6/22, our "Abdo-Muscle Building Punching Ball" appeared on an article on Nikkei Marketing Journal. On 2016/6/20, our "Dash" was featured during late night show "News zero" on Nippon Television Network. 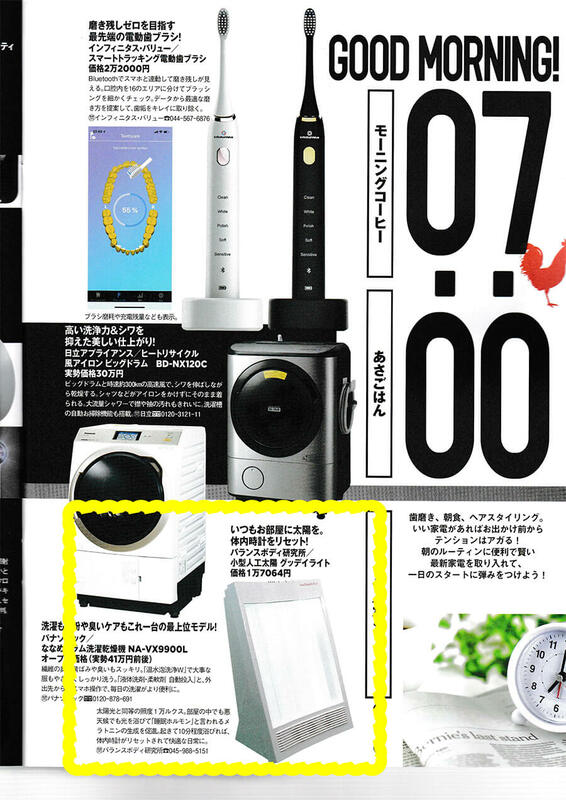 On 2016/6/2, our "Gent-Light Desk Top Lights" was featured on Nikkei Health magazine. 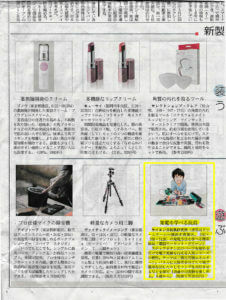 It was also featured on Nikkei WOMAN Online. 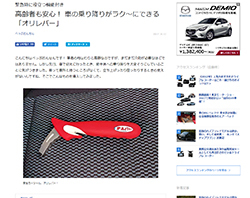 On 2016/5/18, our "Car Assist Handle" appeared on an article on Nikkei Marketing Journal. On 2016/5/18, our "Car Assist Handle" was featured during a late night show "World Business Satellite" on TV Tokyo Network. On 2016/5/16, our "Dash" was featured during an evening show "news every" on Nippon Television Network. 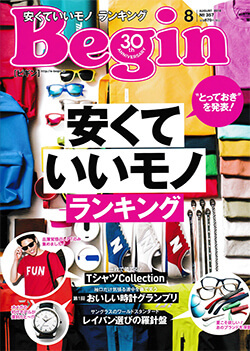 On 2016/5/16, our "Hands Free Laptop Case" was featured on a monthly magazine called "Begin" July issue. Please check out the article here. 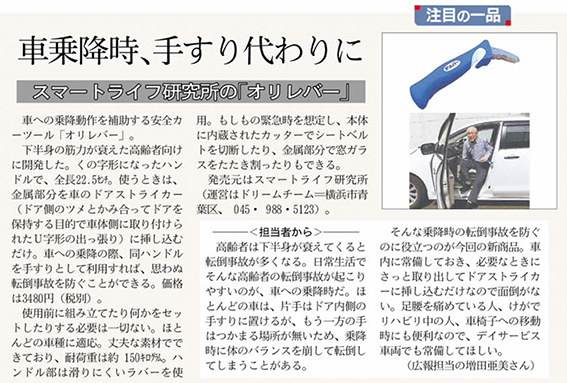 On 2016/4/28, our "Car Assist Handle" was featured on "Asahi Shimbun Digital", the online version of a daily newspaper. Please check out the article here. 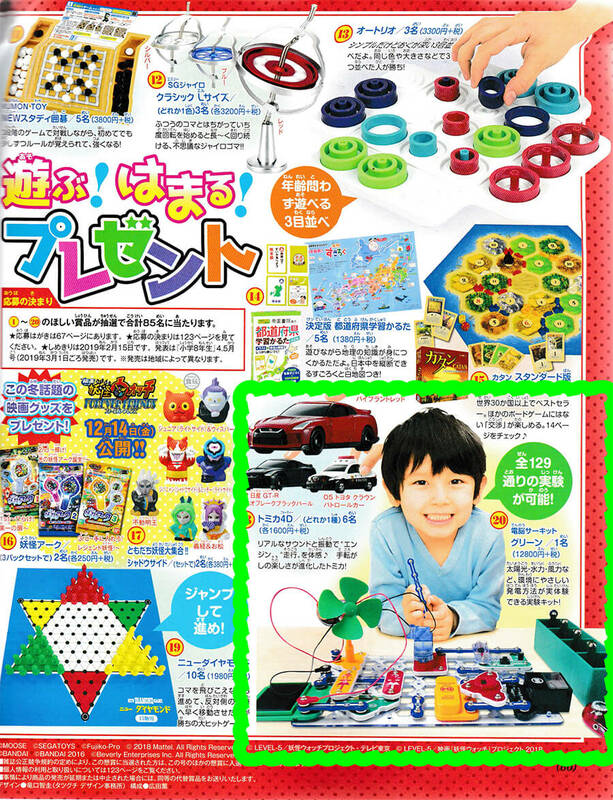 On 2016/4/4, "Electronic Circuits 500" was featured on "Asahi Shougakusei Shinbun" April 4th issue a daily newspaper for elementary kids. Please check out the article here. 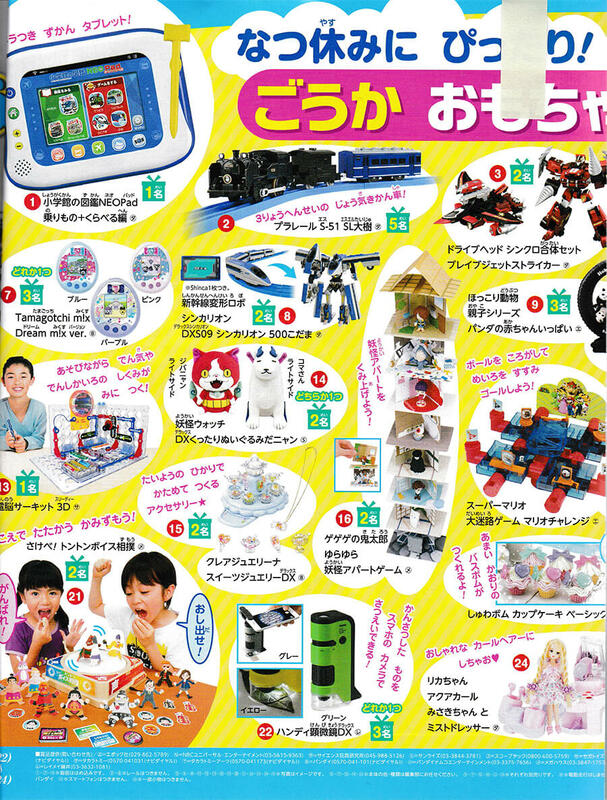 On 2016/4/1, "Electronic Circuits 100" was featured on a monthly magazine for pre-schoolers and kindergarteners called "Tanoshii Yochien" May issue. Please check out the article here. On 2016/3/17, our "Durable Pocket Blanket" was featured on a magazine "Orange Page" April issue. Please check out the article here. 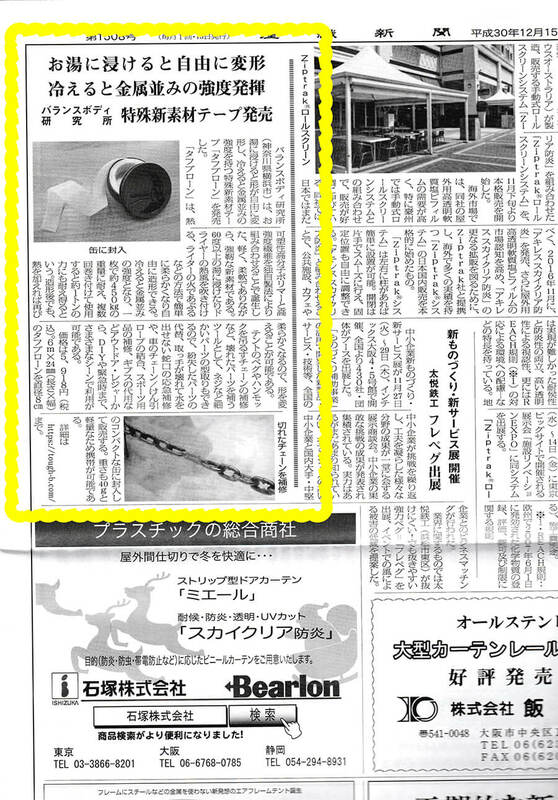 On 2016/3/16, "Moving Straps" was featured on "LOGISTICS TODAY", the nation's largest logistics news site. Please check out the article here. 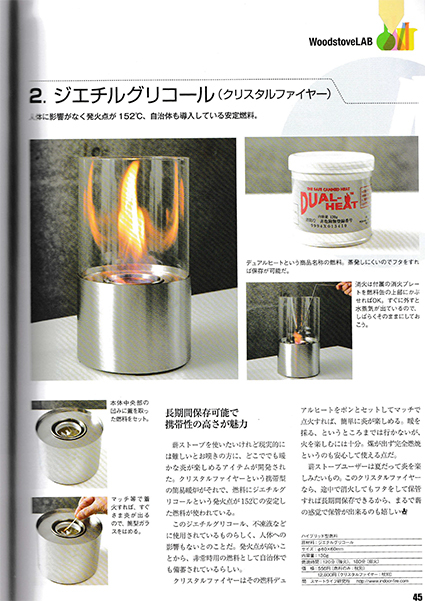 On 2016/2/28, our "Portable Indoor Fireplace" was featured on a magazine called "MAKI stove life" No. 25. Please check out the article here. 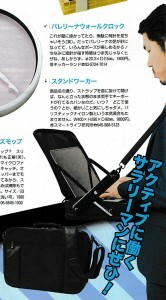 On 2016/2/18, our "Moving Straps" was featured during a morning show "Asa desu" on KBS. 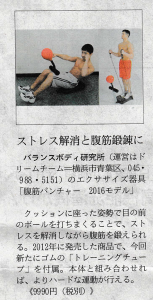 On 2016/1/15, "Abdo-muscle Building Punching Ball" was featured during a TV show "Hayariba" on CHUKYO TV. 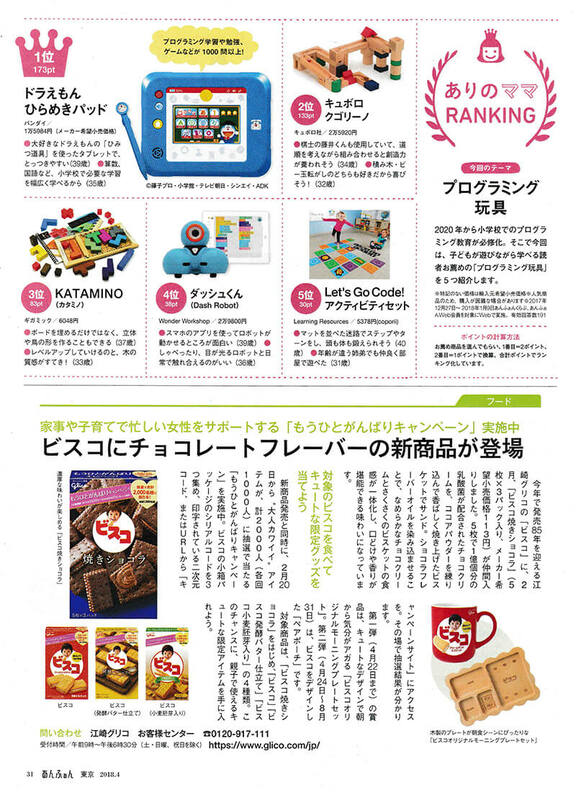 On 2016/1/15, our "Pregnancy Audio Belt" was featured on "Premo" magazine spring issue as the most essential baby/maternity product. On 2016/1/13, our "Pregnancy Audio Belt" was featured during "Kenji Fukui's Good moni" radio show. 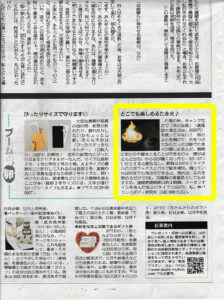 On 2016/1/8, our "Portable Indoor Fireplace" was featured on a web magazine "Otameshi Navi" as an safe and easy authentic portable fireplace for every home. On 2015/12/23, our "Cafebrella" was featured on a popular TV show "Trick Hunter" on Nippon Television Network. 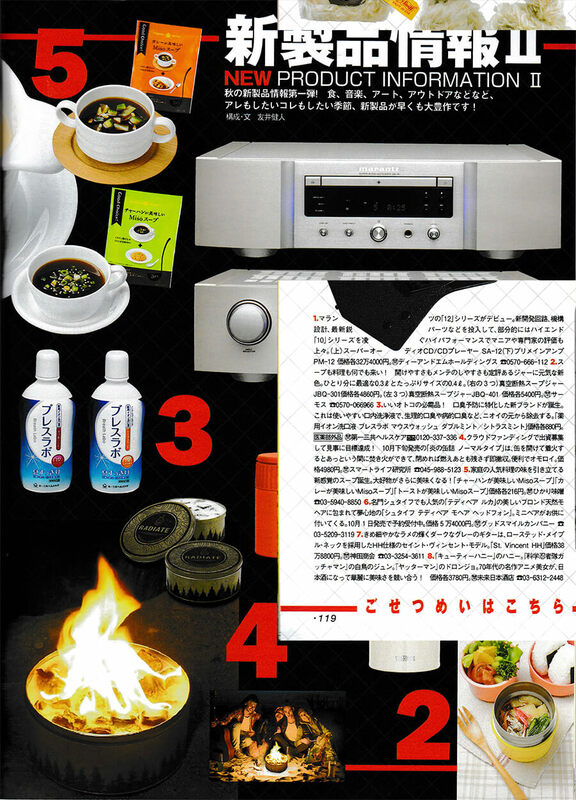 On 2015/12/17, our "Portable Indoor Fireplace" was featured during "POP UP" radio show on J-WAVE. 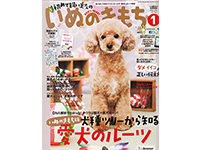 On 2015/12/10, our "Smart Puzzle Ball mini" was featured on "Inu no Kimochi" January issue as a smart toy to entertain dogs while nobody else is home. On 2015/12/8,our "Anti-Slipping Glasses Wax" was featured during MSB radio show. 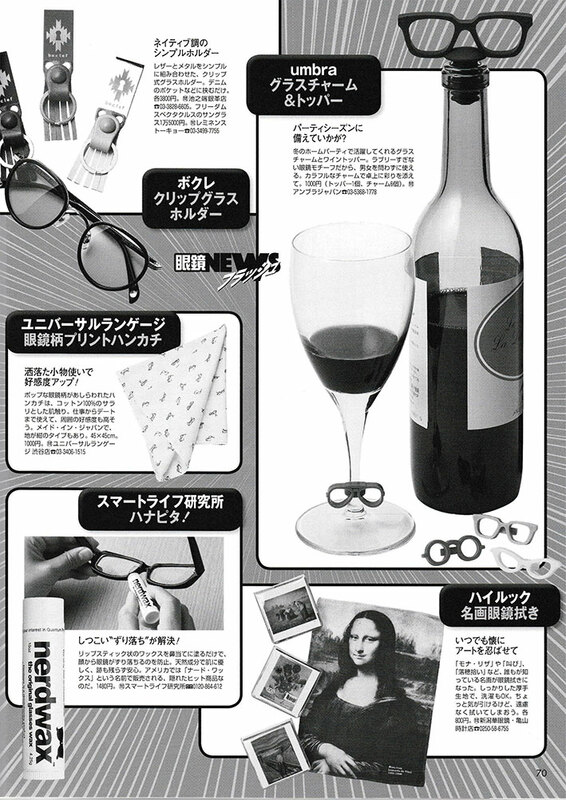 On 2015/11/30, our "Anti-Slipping Glasses Wax" was featured on "Glasses Begin" magazine vol.19. 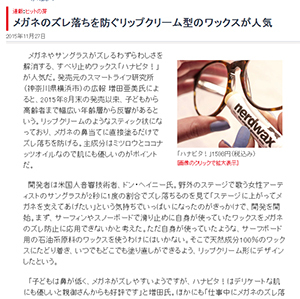 On 2015/11/27, our "Anti-Slipping Glasses Wax" was featured on Nikkei Trendy magazine. On 2015/11/24, our "Cafebrella" was featured on STV afternoon show as a useful coffee related product. 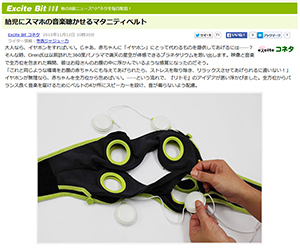 On 2015/11/12, our "Pregnancy Audio Belt" was featured on "Excite Bit" web magazine. 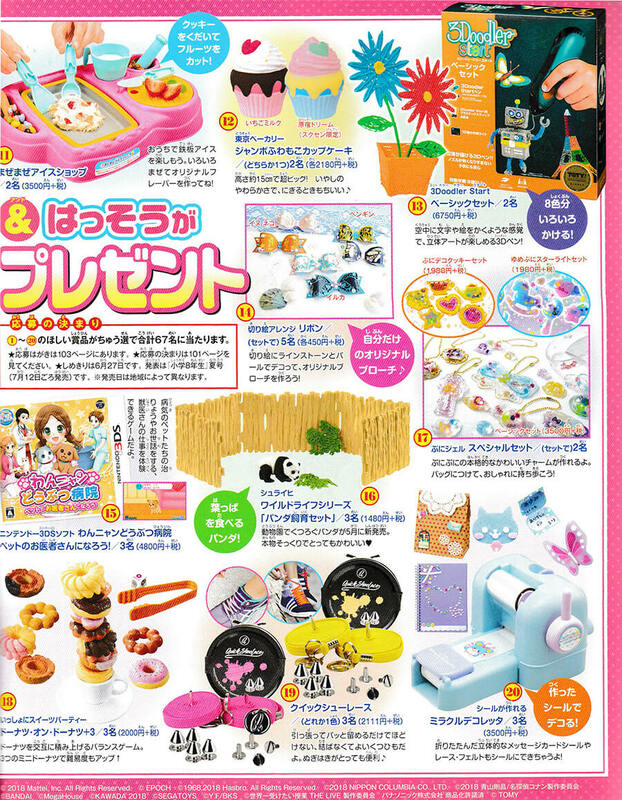 On 201510/23, our "Anti-Slipping Glasses Wax" was featured on "Beach Valley Style Magazine" October issue. 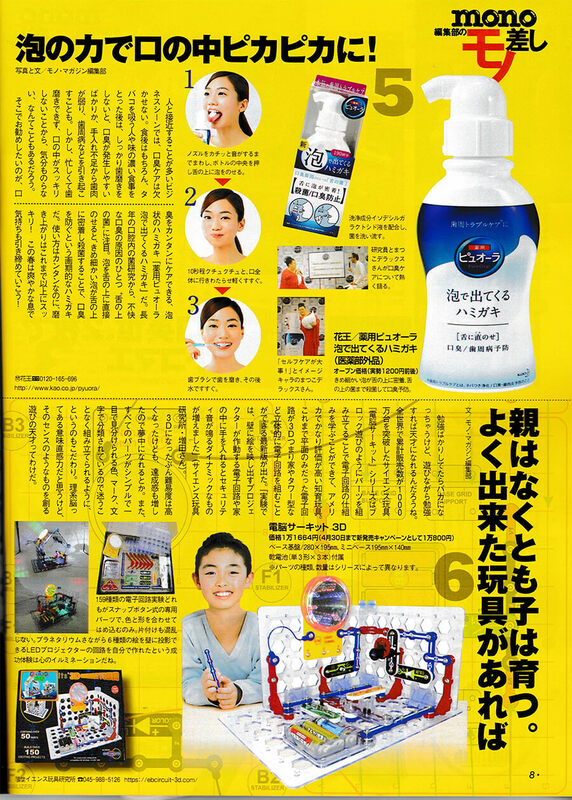 On 201510/17, our "Anti-Slipping Glasses Wax" was featured on "Car Goods Magazine" December issue. 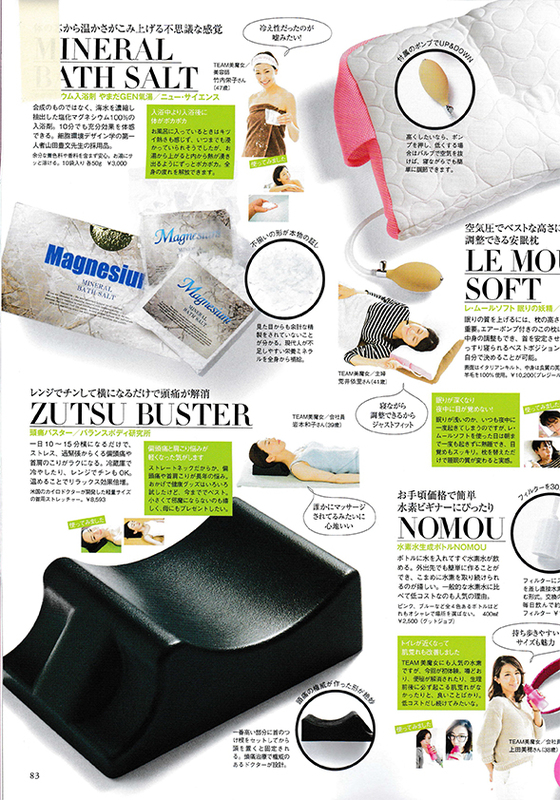 On 201510/17, our "Headache Relieving Pillow" was featured on a magazine "Beauty ST" December issue. On 201510/12, our "Durable Pocket Blanket" was featured as a useful hiking product during an afternoon TV show on RKB. Our "Umbrella Table Screen" was featured as a useful outdoor goods on a popular NHK morning show on 201510/7. 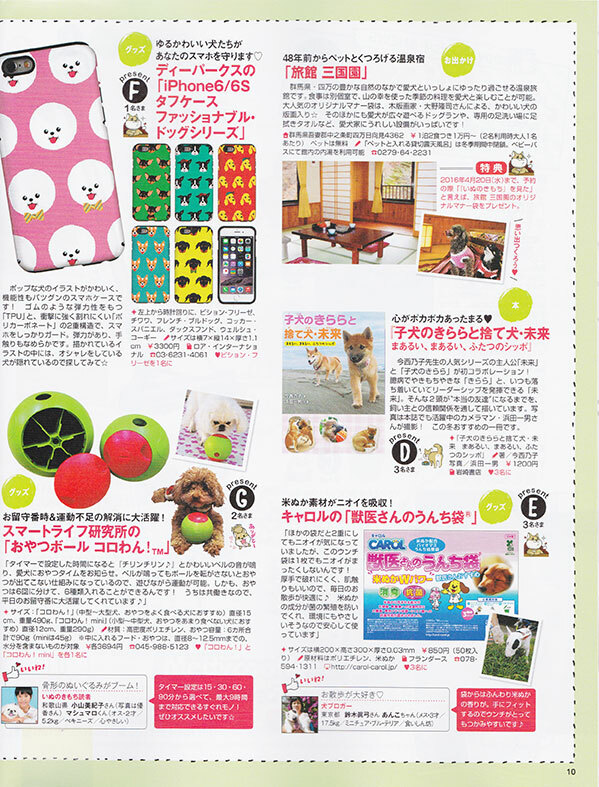 On 201510/2 during World Business Satellite (Tokyo Television), "Smart Puzzle Ball" was featured t as a useful pet product for busy dog lovers. 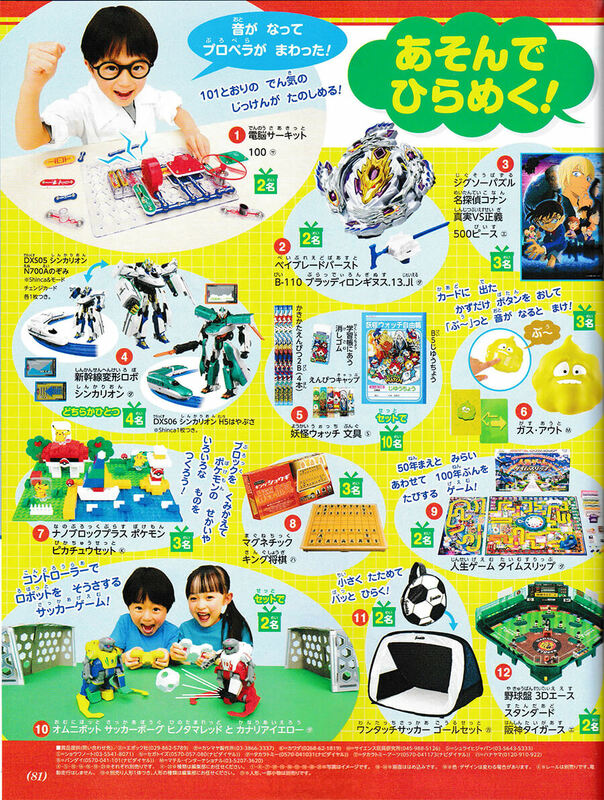 On 2015/9/28, our "Smart Puzzle Ball" was featured on a HBC morning TV show. 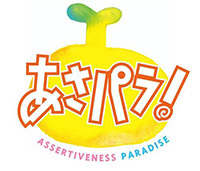 On 2015/9/28, our "Abdo-Muscle Building Punching Ball" appeared on a popular TV series called "Date -What's it like to fall in love?-" on Fuji Television. 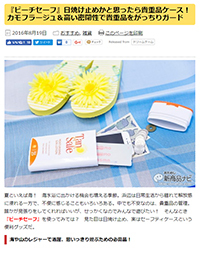 On 2015/9/12, our "Anti-Slipping Glasses Wax" was featured on Excite Bit web news. On 2015/9/4, our "iMicroscope" was featured on Nikkei Trendy magazine as a cool smartphone accessary. 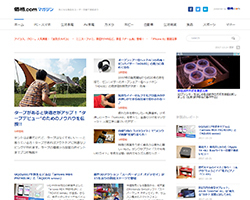 On 2015/8/10, our "Umbrella Table Screen" appeared on an article on Nikkei Marketing Journal. 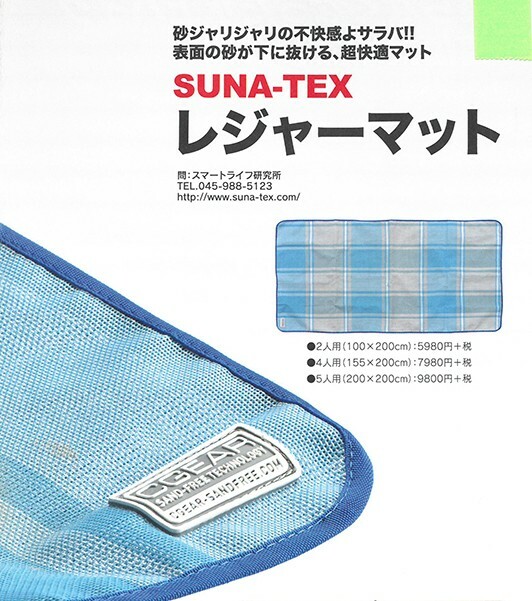 On 2015/7/16, "Sand Removing Mat" was featured during a popular afternoon show on Nippon Television Network as the most useful beach product. On 2015/7/15, our "Sand Removing Mat" was featured as a useful summer leisure product on BSS TV show. On 2015/7/4 our "Sand Removing Mat" was featured during a TV show on Akita Asahi Broadcasting Station as a useful product on the beach. 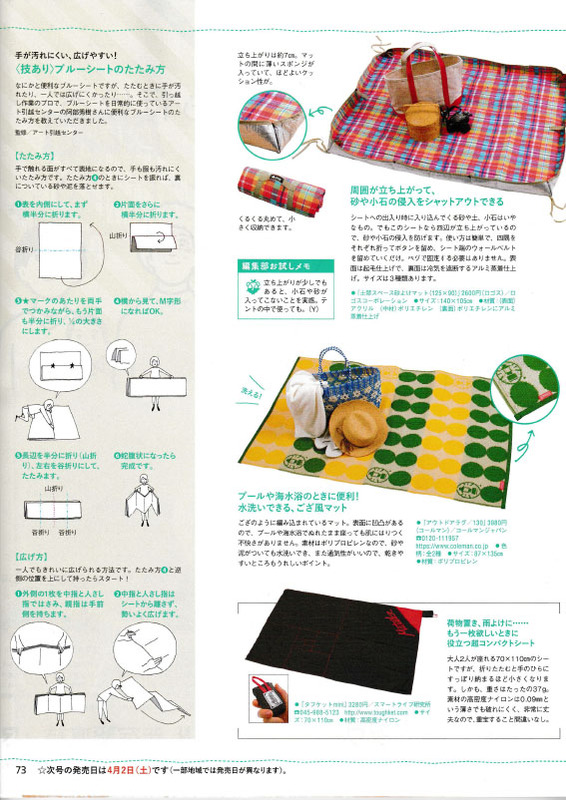 On 2015/7/4, our "Sand Removing Mat" was featured as the hot product in summer season during a TV show on Hokkaido channel. 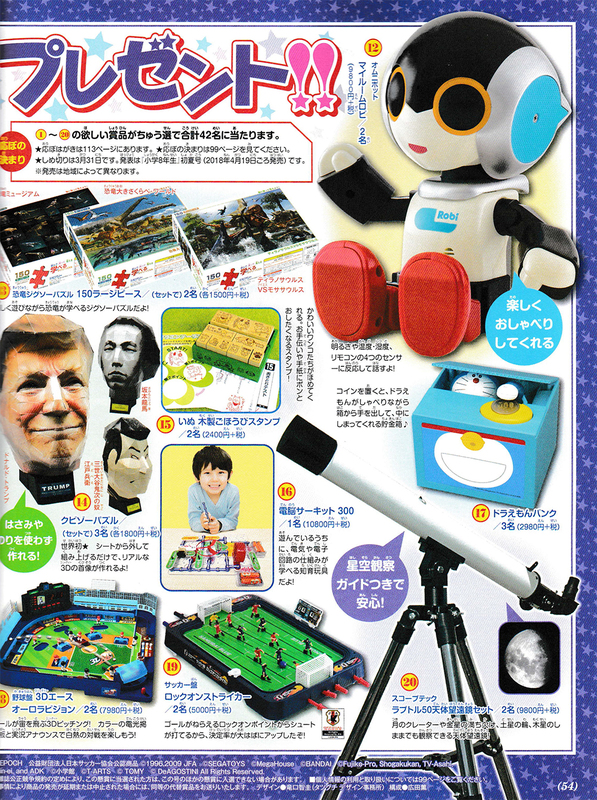 On2015/6/24, our "Smart Puzzle Ball" was featured on NHK nationwide morning news. 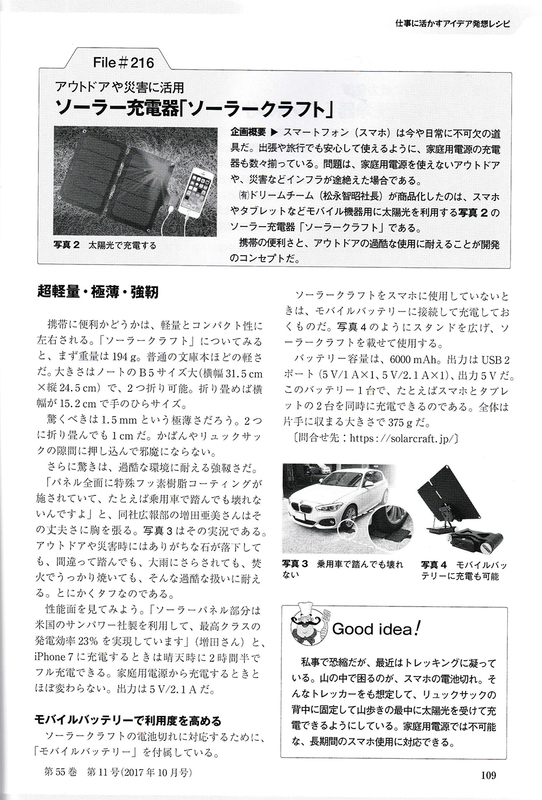 An article of "Solar Pad" appeared on Car Goods Magazine on 2015/6/17. 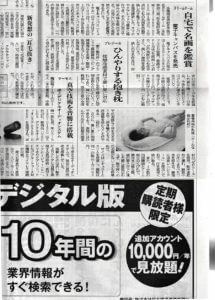 Our "Snore Activated Pillow" was introduced during Ima-chan's Actually...on ABC Asahi broadcasting station on 2015/6/10. 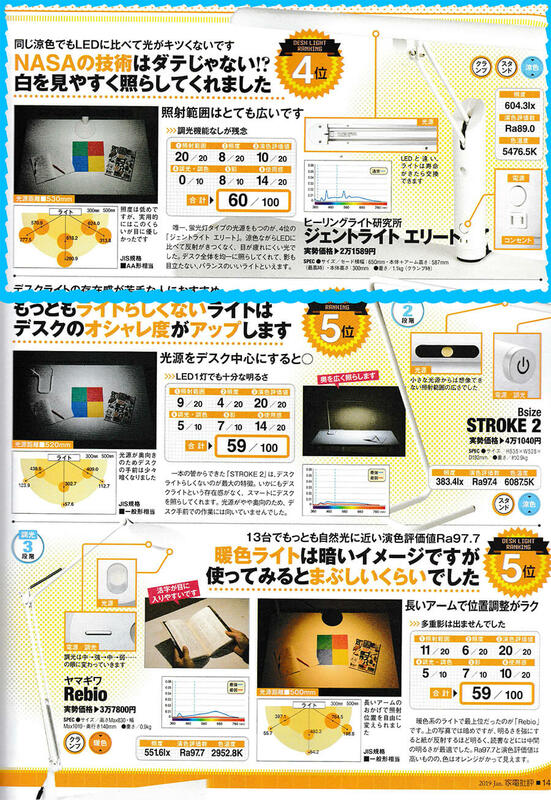 "Snore Activated Pillow" won the award of excellence in Health Care Electric Appliance category on 2015/6/10. "Snore Activated Pillow"was featured during a TV show DUOMO on KBC TV on 2015/5/27. 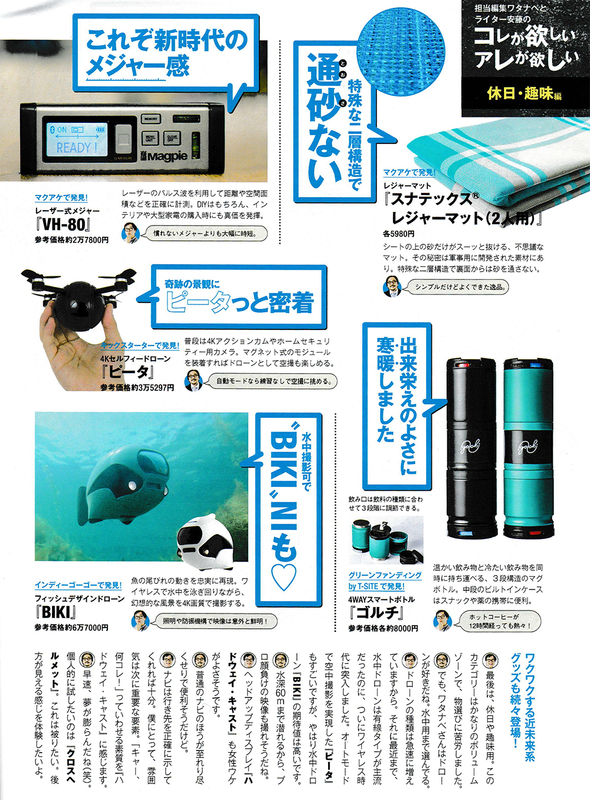 On 2015/5/16, "Snore Activated Pillow" was featured on a magazine Begin. 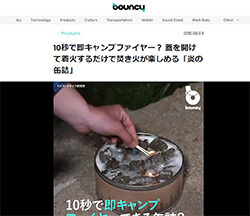 "Foldable Pot" was featured during a TV show Dosanko-Wide on Sapporo TV on 2015/5/12. 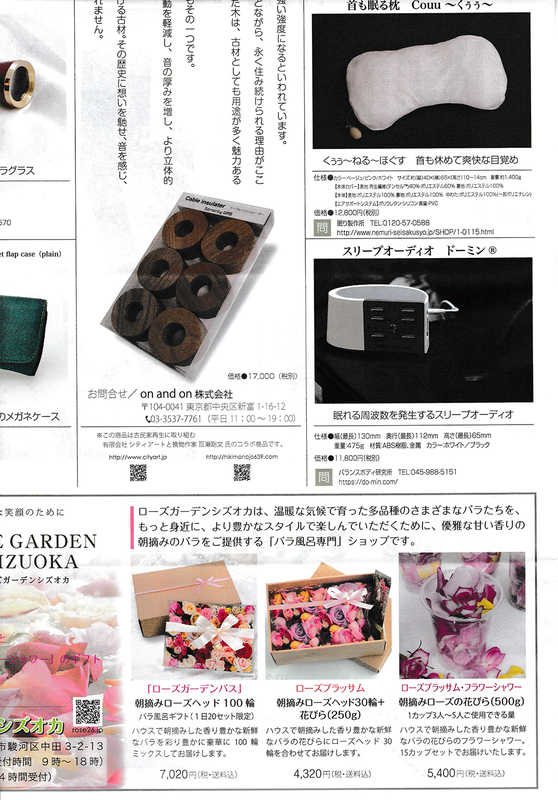 "Sand Removing Mat" and "Foldable Pot" were introduced during NHK nationwide morning news on 2015/5/5. 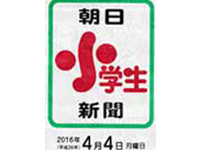 "Snore Activated Pillow" was featured during a radio show on Nippon Cultural Broadcasting on 2015/5/5. 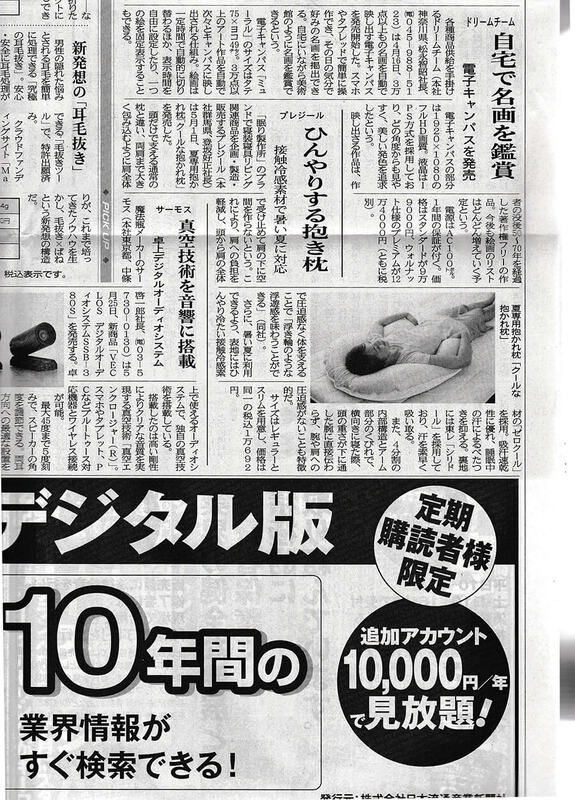 An article of "Snore Activated Pillow" appeared on Nikkei Health magazine on 2015/5/2. 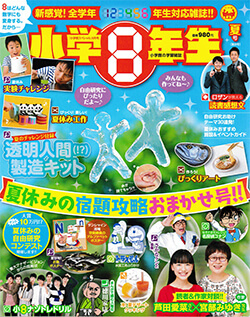 "Snore Activated Pillow" was featured on a magazine TOKUSENGAI on 2015/5/2. 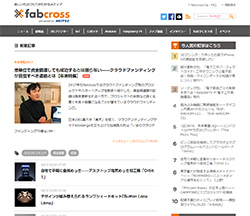 "The Micro" was featured on an online magazine fabcross on 2015/5/1. Our "Durable Pocket Blanket" was featured during NHK nationwide morning news on 2015/4/22. 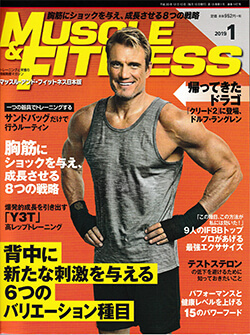 "Handly Muscle Builder" was featured during a TV show Biking on Fuji Television Network on 2015/4/17. 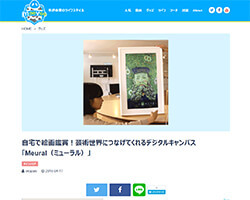 "Miracle Solar Pot" was introduced during a TV show Mushac on Kansai Telecasting on 2015/4/10. 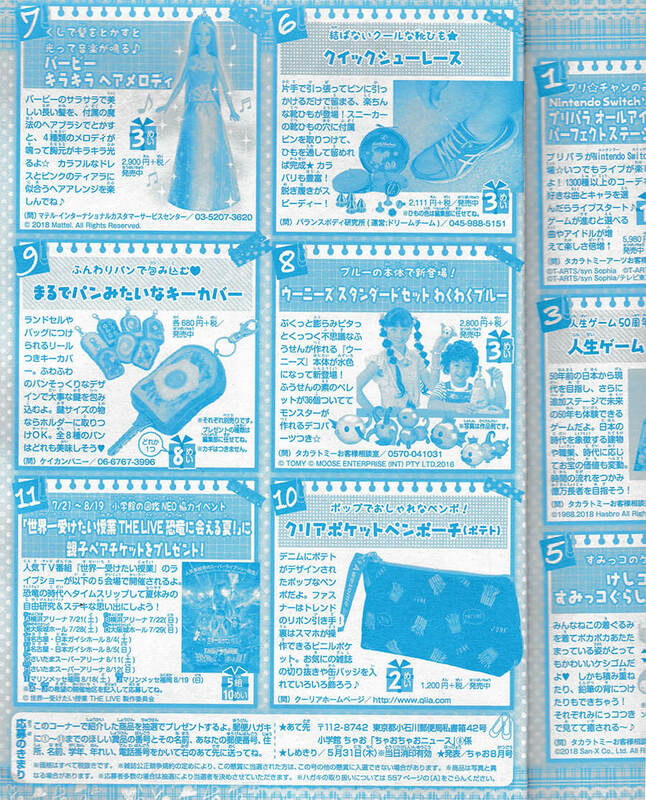 "Snore Activated Pillow" was featured on a magazine Excite Bit on 2015/4/9. "Hands Free Laptop Case" was featured on Nikkei MJ magazine on 2015/4/6. 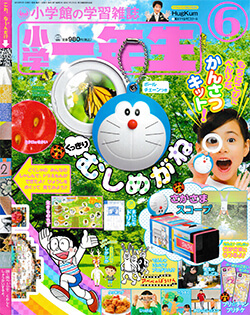 "Durable Pocket Blanket" and "Panorama Photographing Turntable" were introduced during a popular morning show on Yomiuri Telecasting on 2015/4/4. 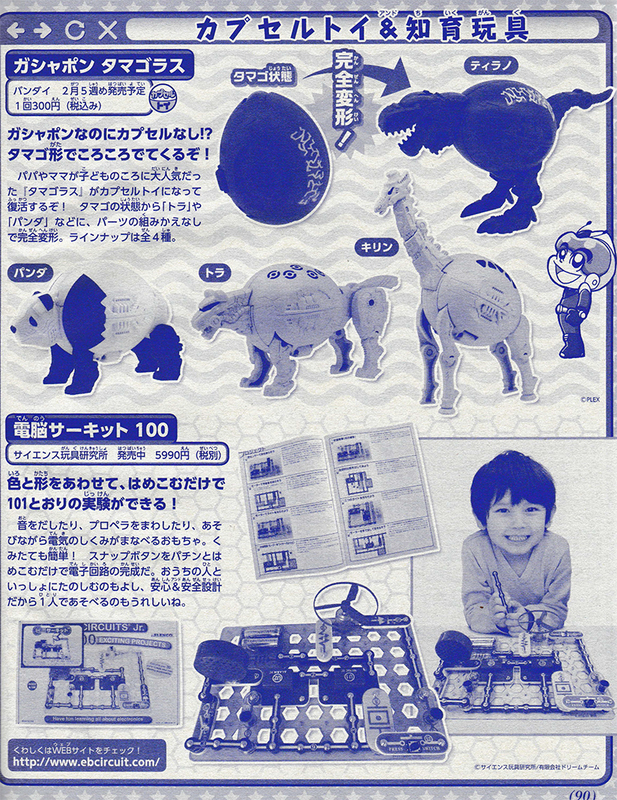 On 2015/2/11, "Smart Puzzle Ball" was featured on "Nikkei Marketing Journal". 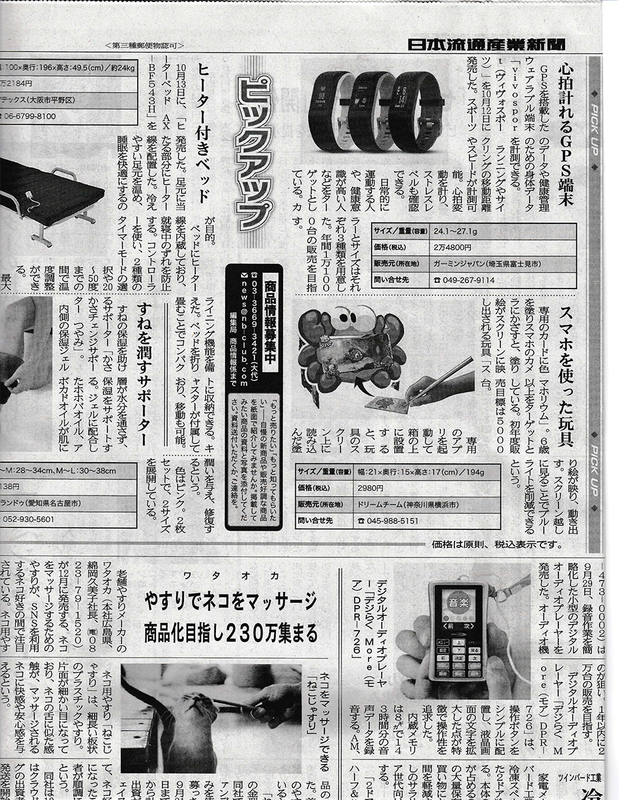 On 2015/1/19, Check out an article about "Panorama Photographing Turntable" on "Nikkei Marketing Journal". 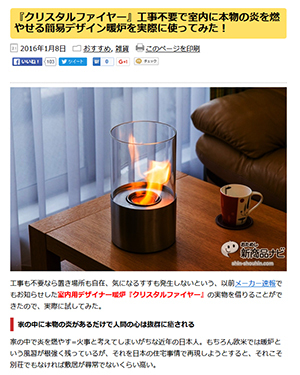 On 2014/12/31, "Portable Indoor Fireplace" was featured on "Excite Bit" news. 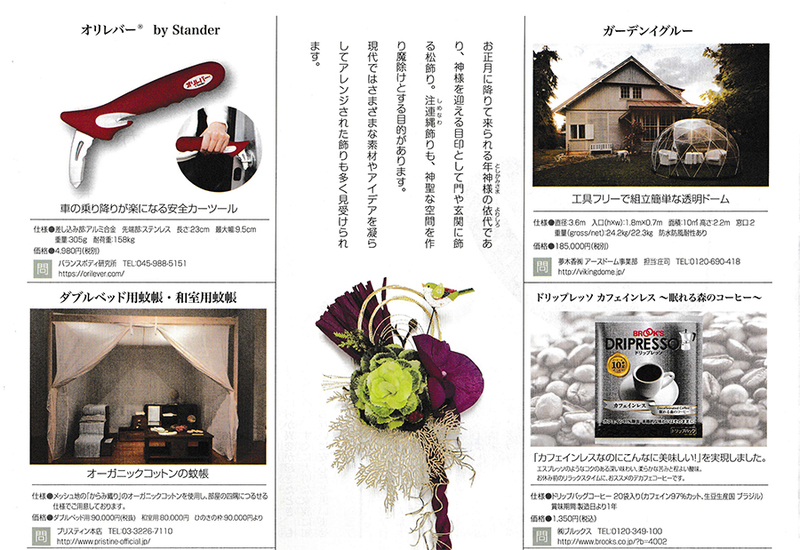 On 2014/12/17, "Headache Relieving Pillow" was featured on "an an" February issue. 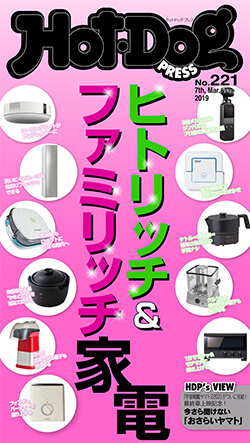 We will be participating SORA EXPO on 2014/12/23 in Makuhari Messe 8th Hall. 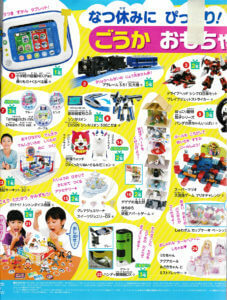 Demonstration sales for "Durable Pocket Blanket", "Mobile Solar Power Plant" and "Eco Redio Mini" will be conducted. 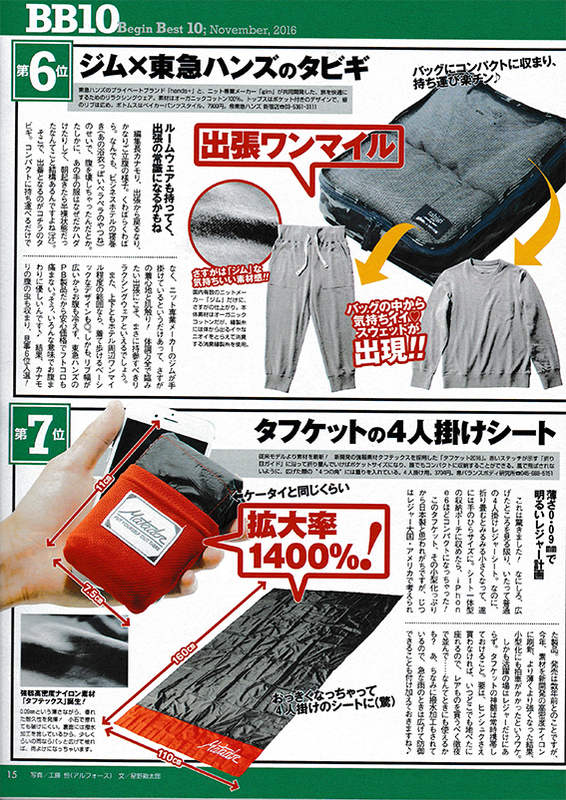 On 2014/12/18, "Durable Pocket Blanket" was featured on "NIKKEI TRENDY NET news". 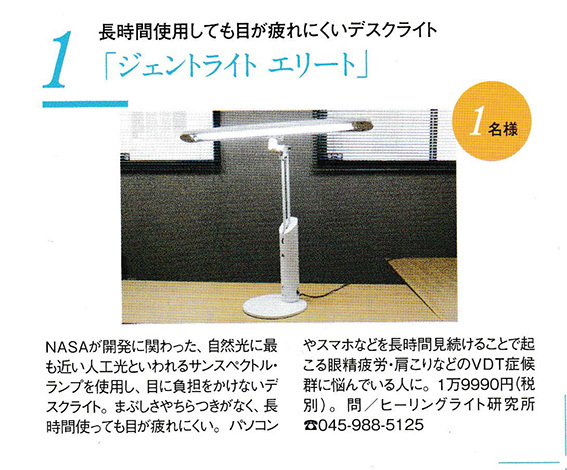 On 2014/11/29, "Natural Light LED Desk Lamp PRO" were used in a movie "PARASYTE". On 2014/11/24, "Durable Pocket Blanket" was introduced on TBS morning news. 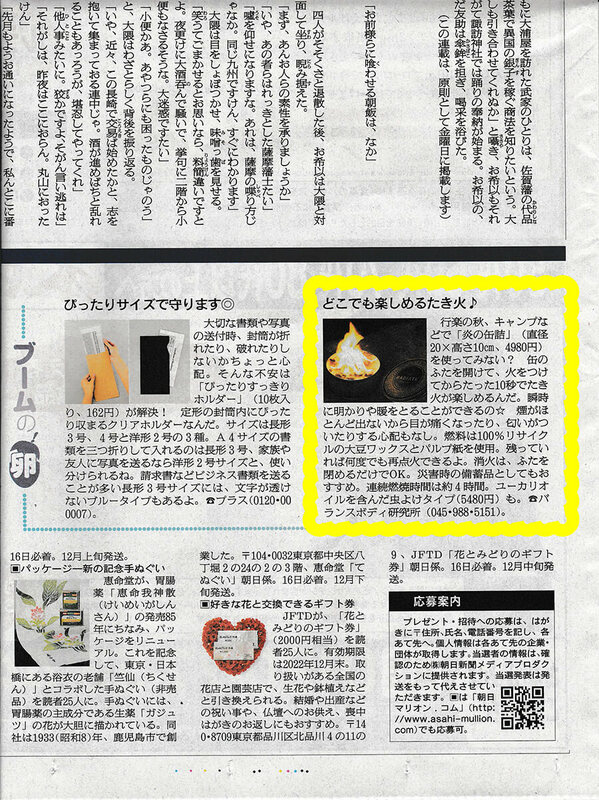 On 2014/11/12, Check out an article about "Durable Pocket Blanket" on "Nikkei Marketing Journal." 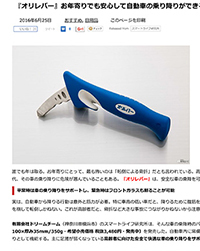 On 2014/9/1, "Pitagora Stand-Pocket Tripod-" was featured on NHK nationwide morning news. "Sand Removing Mat" was featured on TBS morning news on 2014/8/27. 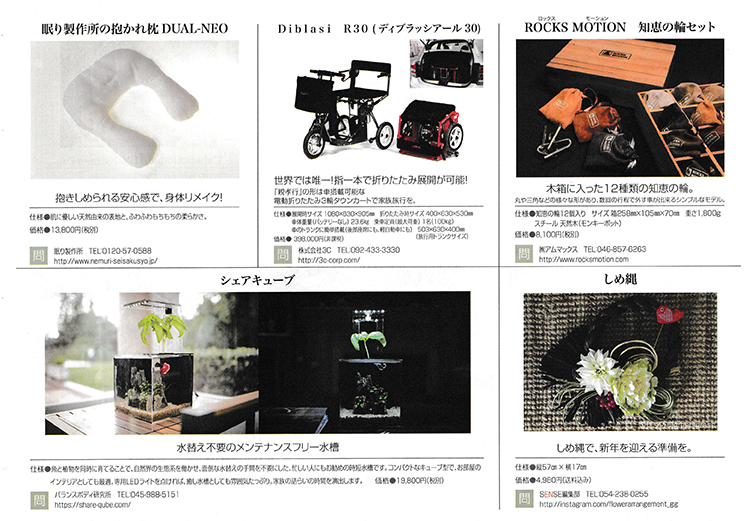 Our "Foldable Pot"was featured on NHK nationwide morning news on 2014/8/13. 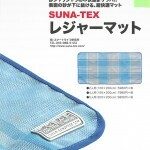 2014/7/30, "Sand Removing Mat" was featured on a popular morning show on "FUJI Television Network". 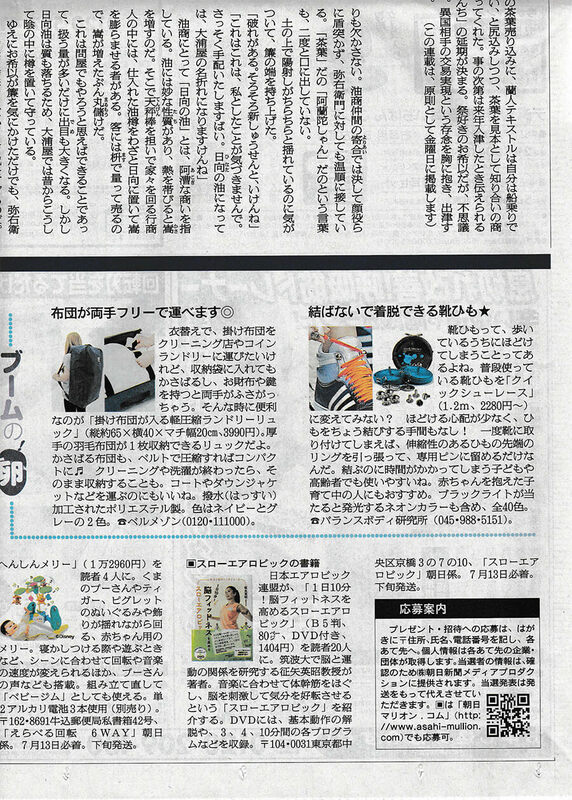 2014/7/22, "Sand Removing Mat" was featured on a morning show on "Yomiuri Telecasting Corporation". 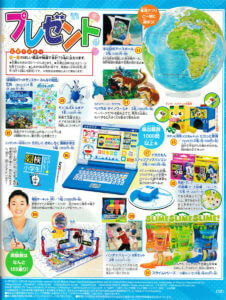 "Sand Removing Mat" was featured in the 7/8 issue of "Excite Bit". 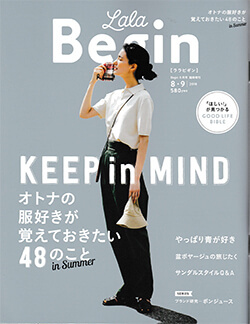 "Alcohol Breathalyzer" was featured on "LEON" July issue on 2014/5/24. 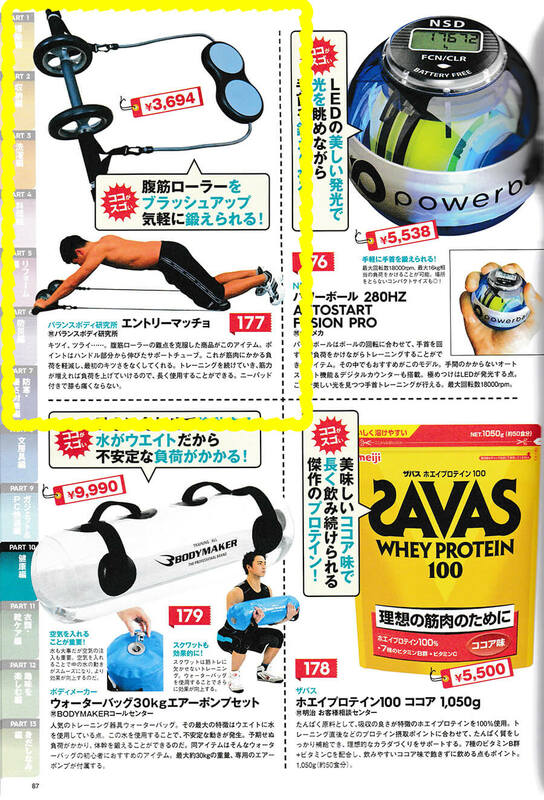 "Mobile Muscle Builder" was featured on "IRON MAN" June issue on 2014/5/12. "Moving Straps" was featured on "FM Yamaguchi" on 2014/3/21. 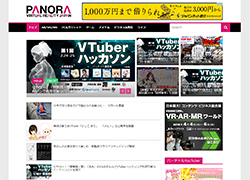 ->Check out 20140321.mp3 (Japanese) to listen to the advertisement. 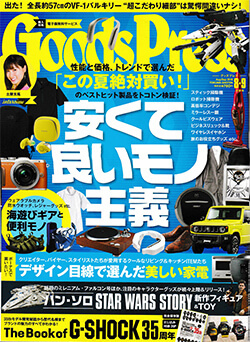 "Trunk Baggage Keeper" was featured on "NIKKEI Trendy Net" on 2014/3/17. 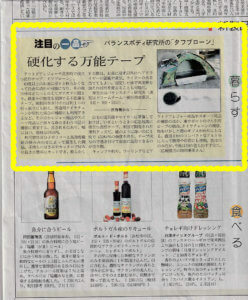 "Alcohol Breathalyzer" was featured in "Nikkei Marketing Journal" on 2014/2/14. 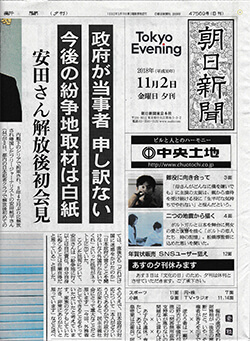 "Sand Removing Mat" was featured on NHK nationwide morning news on 2013/10/17. 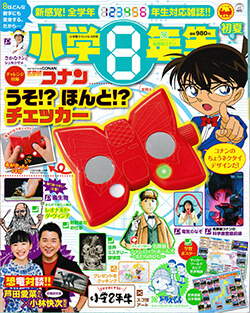 "Good Vision Sensor" was featured on a popular TV show on "Television Tokyo" on 2013/9/25. 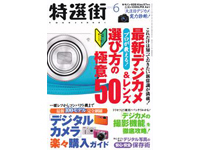 "Microscope Camera" was featured on "iPhone Magazine" on 2013/9/19. 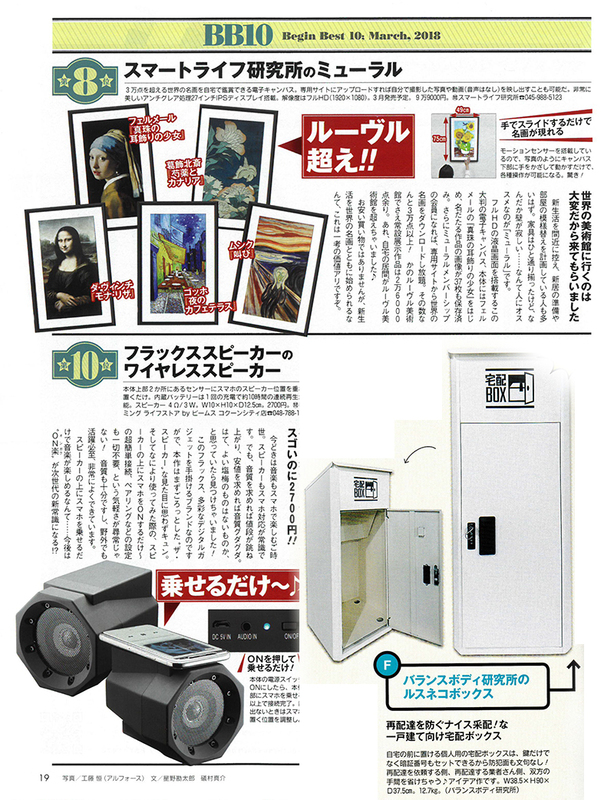 On 2013/8/27, "Microscope Camera" was featured on "The Nikkei" which has a large circulation all over Japan. 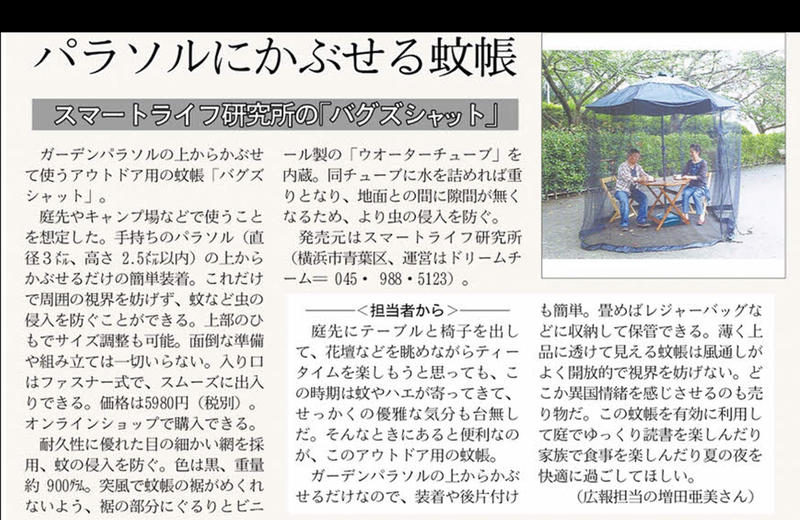 On 2013/8/17, "Cafebrella" was featured on "Sankei Newspaper" which has a large circulation all over Japan. 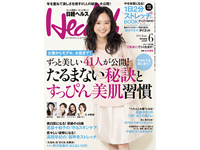 "Hair fixing cap" was featured on NHK nationwide morning news on 2013/8/1. 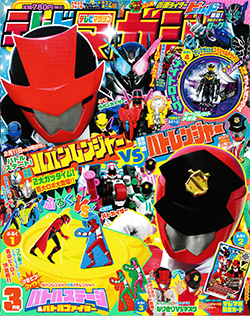 "Hair Fixing Cap" and others were featured on a popular radio program on "SBS radio Shizuoka" on 2013/7/31. "Cafebrella" was featured on NHK nationwide morning news on 2013/7/30. 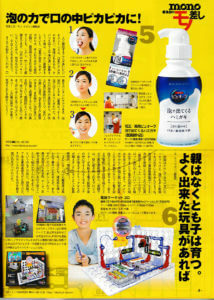 "Hair fixing cap" was featured in "Nikkei Marketing Journal" on 2013/5/6. "Hair Fixing Cap" was featured on a TV show on "KBS Kyoto" on 2013/7/20. 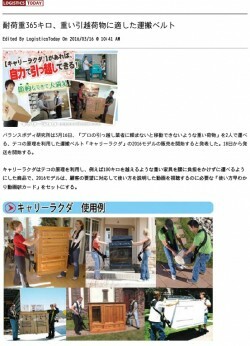 "Sand Removing Mat" was featured on a popular afternoon news program on "Hokkaido Cultural Broadcasting" on 2013/7/16. On 2013/7/16, "Sand Removing Mat" was featured on one of the most popular nationwide morning shows on "Nippon Television". On 2013/7/6,"iGuard" was featured on a popular long-running morning show on "Yomiuri Telecasting Corporation" which is one of the biggest TV stations in Japan. "Hair Fixing Cap" was featured on a morning show on "ASAHI broadcasting station" on 2013/6/11. 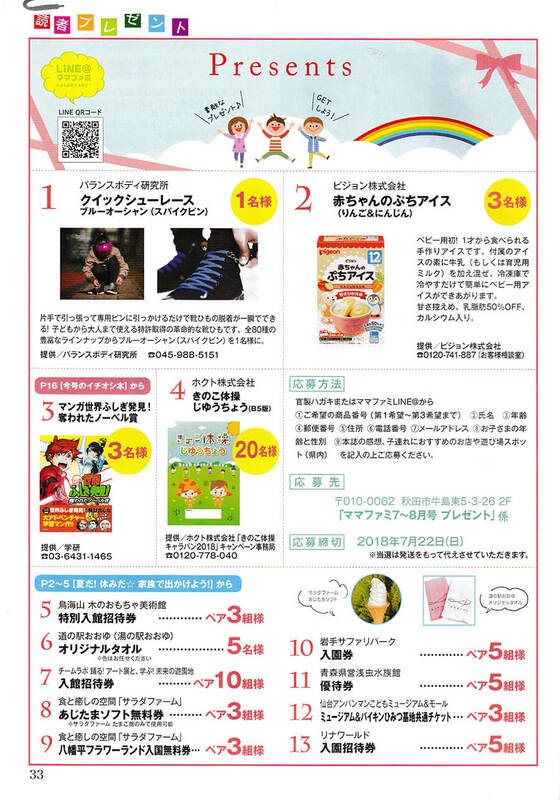 "Hair Fixing Cap" was featured during a morning program on the "HBC radio station" on 2013/6/10. 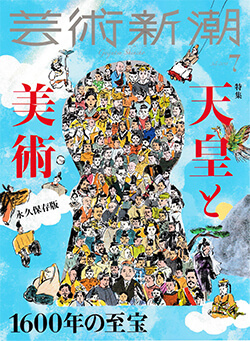 On 2013/6/3, "Hair Fixing Cap" was featured on a popular nationwide broadcasting show on "FUJI Television Network" which has one of the highest viewer ratings throughout Japan. 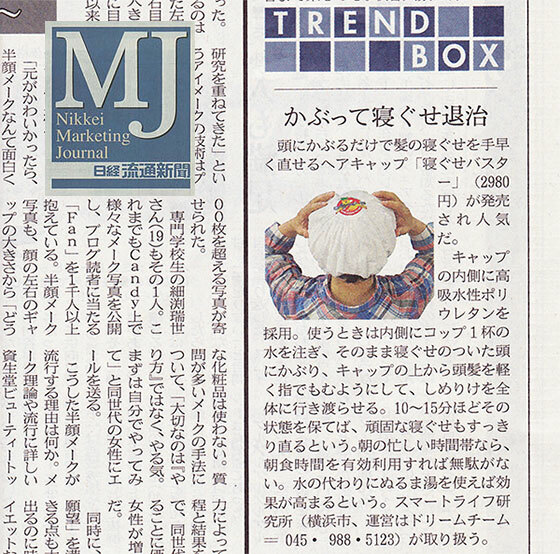 "Hair fixing Cap" was featured on the "NIKKEI Trendy Net" on 2013/5/28. 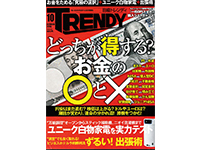 *NIKKEI Trendy Net is a well-known portal site which webcasts trend information and has millions of viewers. 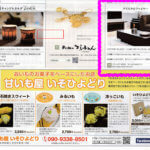 On 2013/5/22, "Wi-Fi Plant Sensor" was introduced on "Nippon Television Network" which is one of the biggest nationwide broadcasting stations in Japan. 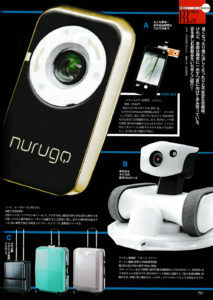 "iGuard" was featured on NHK morning news on 2013/5/13. 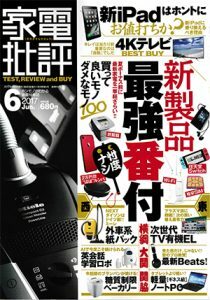 *NHK is recognized as a respected state-run broadcasting station which has the highest audience ratings all over Japan. "Hair fixing cap" was featured on a hit radio program "FM OSAKA" on 2013/5/7. 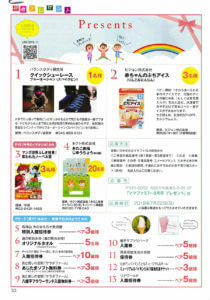 "Flash Safety" was featured on NHK morning news on 2013/4/8. 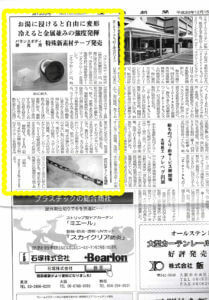 "Abdo-Muscle Building Punching Ball" was featured on NHK morning news on 2013/1/21. 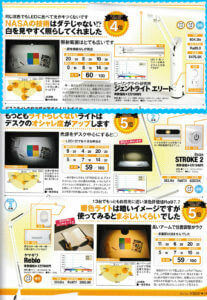 "Handy Muscle Builder" and "Wi-Fi plant sensor" were featured in "Nikkei Marketing Journal" on 2012/11/30. "Moving straps" were featured on a popular late-night show on 2012/3/14. 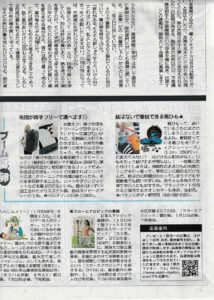 "Moving straps" were featured on a popular morning news program on 2012/3/13. 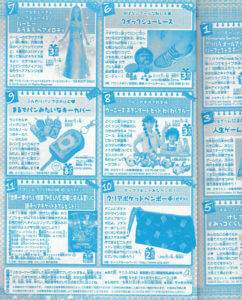 "Moving straps" were featured on one of the most popular TV shows on 2011/7/9.